I discover that neither of the two frying pans I thought I had packed actually made it on the trip. Breakfast is limited to oatmeal and buttermilk over brain cereal. And it looks like the oranges didn’t make it, either; so much for my morning snack. and see if I can spot some of the surrounding sedimentary formations. To the south, there are a few rain clouds already showing virga. There is also a gravel road through the mountains, and the notice board at my campsite says it is passable for passenger vehicles in good weather. I drive along the road to the base of the dome, park, and start my hike. Beneath me is Brushy Basin Member of the Morrison Formation, mantled in soil. 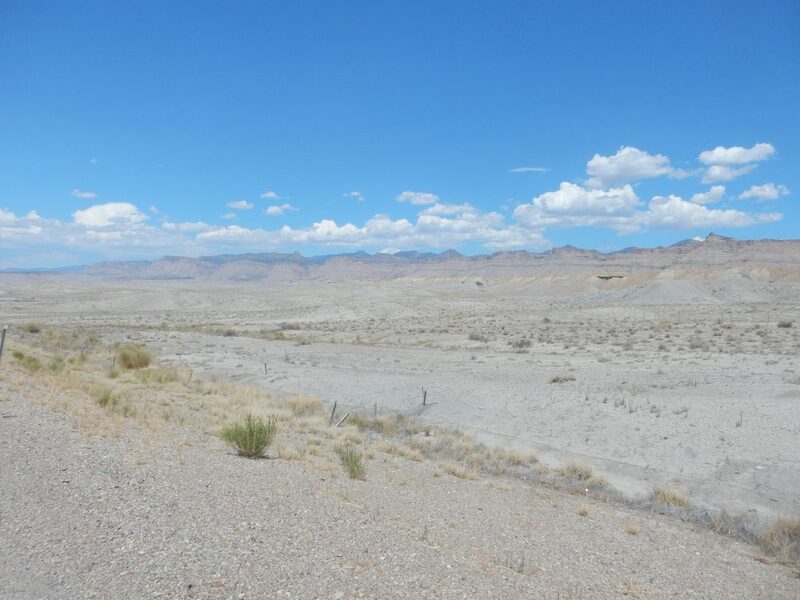 The Morrison is a Jurassic formation from around 150 million years ago, a time when the area was river floodplains, and it is a very diverse formation, with numerous members. The Verdure Fault is just in front of me, though I do not know this at the time (only when I get home and check the map) but it is also mantled under soil. I proceed up the ridge to my first rock outcropping. This is still Morrison Formation. 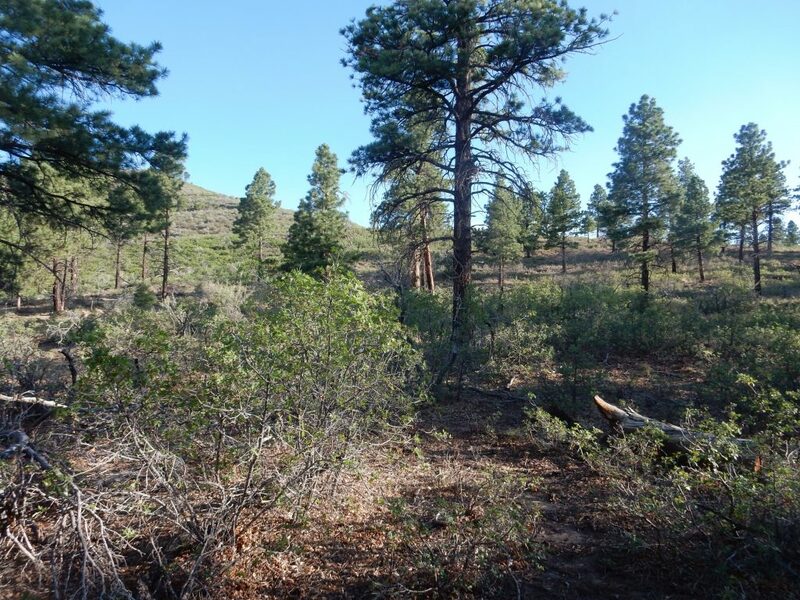 The climb is fairly pleasant; the ridge has scrub, but it is relatively inoffensive brush oak. The next outcrop is more solid. But this is still well down in the Morrison. 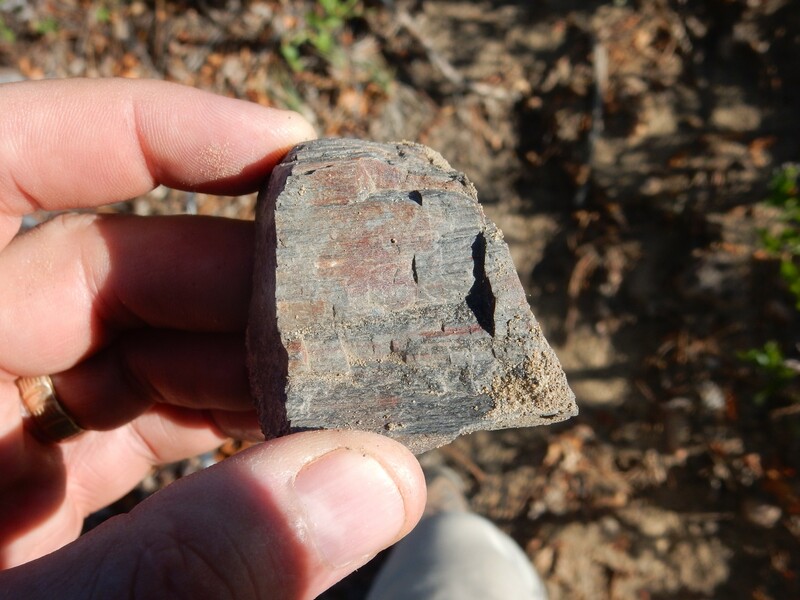 I come across a bit of what looks like petrified wood. In the distance, Bear’s Ears. 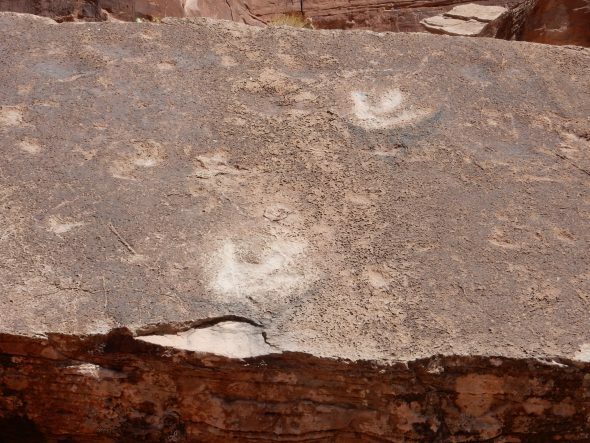 Possible trace fossils in the Morrison? I continue up the hill, taking photos and getting GPS fixes. The geologic map I have is not that fine of scale; the GPS has limited accuracy; I don’t know if I’ll be able to match things up. But I’m still in the Morrison, which is most of the lower slope of the ridge. 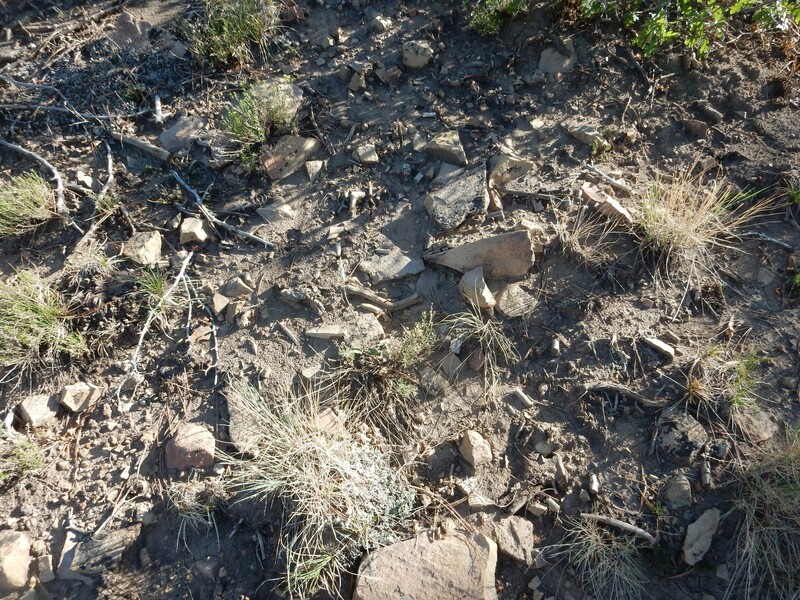 This looks a lot like Navajo Sandstone, but that’s not supposed to come until much further up the hill. I see many more exposures like this as I climb. All are apparently Morrison. I reach a crest, and see what looks like the ring of sedimentary beds around the laccolith. I can’t actually match this up with anything on my map. But my coordinates seem to place me, finally, on the next older bed — the Summerville Formation. This is mud flat deposits, not very resistant, and it’s poorly exposed here. I get a telephoto panorama across the unnamed arroyo to the north. These I think I can match up with the map. The ridges at far right are resistant lower (therefore older) beds of the Morrison Formation. The small drainage at right center corresponds to the less resistant Summerville Formation (here renamed the Wanakah Formation). The ridge at center is the resistant Moab Member of the Entrada Formation, unless it’s the Moab Member of the Curtis Formation; there seems to be some dispute among geologists about it. 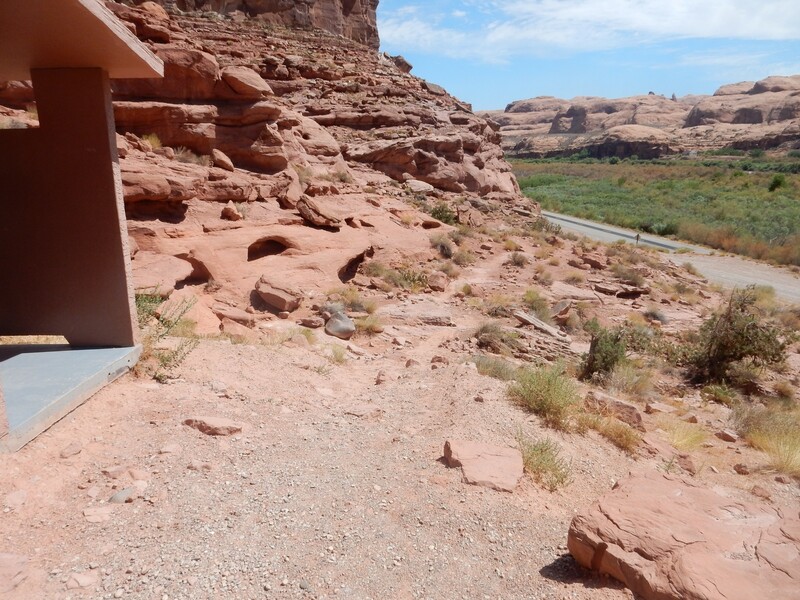 The less resistant lower beds of the Entrada form the dip to their left. The Entrada was deposited in a dune sea, as was the lighter beds of the Navajo Formation to left. 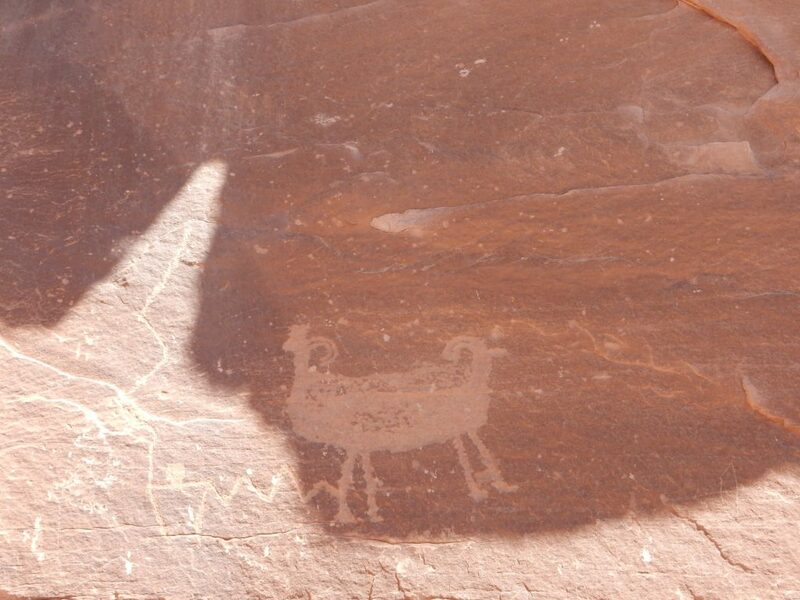 Then comes less resistant Kayenta Formation, laid down by a network of small rivers, at farthest left. I’m standing just south of the Moab Member on my own ridge as I take this photograph. Note how all the beds dip to the right, with older beds to the left. The laccolith is to the left, off camera, and has pushed up and tilted the beds in this manner. Further in the distance are some striking beds. 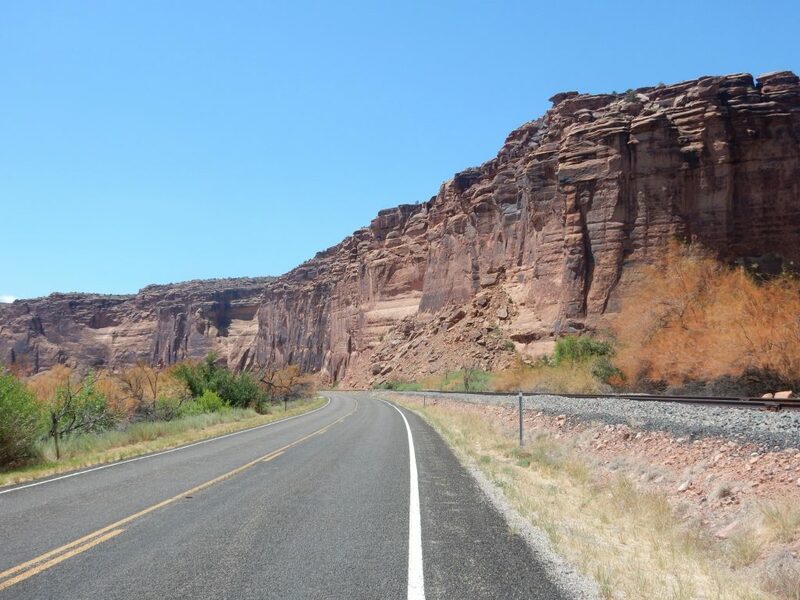 The red beds are Chinle Formation, overlain by Wingate Sandstone. The Wingate Sandstonen is another dune sea, laid down at the beginning of the Jurassic (200 million years ago), while the Chinle are more river deposits laid down in the Triassic, around 210 million years ago. 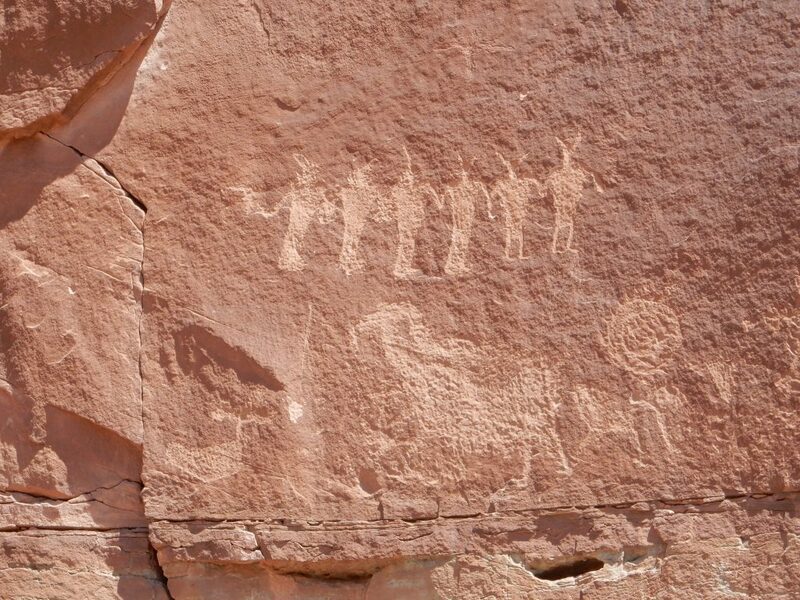 The great Chinle River stretched from the young Appalachians to the Pacific coast, in Nevada at that time, and passed very near the Jemez back home. I notice what must be logging roads on the mountain to the east. They’re too regular to be upturned sedimentary beds. I reach a definite ledge in the ridge. This is likely the resistant Moab Member. I reach the top of a knob in the Moab Member. To my northwest is the main laccolith dome, and to the north are sedimentary beds it has pushed up. The break between light and red beds just left of center marks the Dry Wash Fault. The red is Cutler Formation beds of the Permian, 290 million years ago. 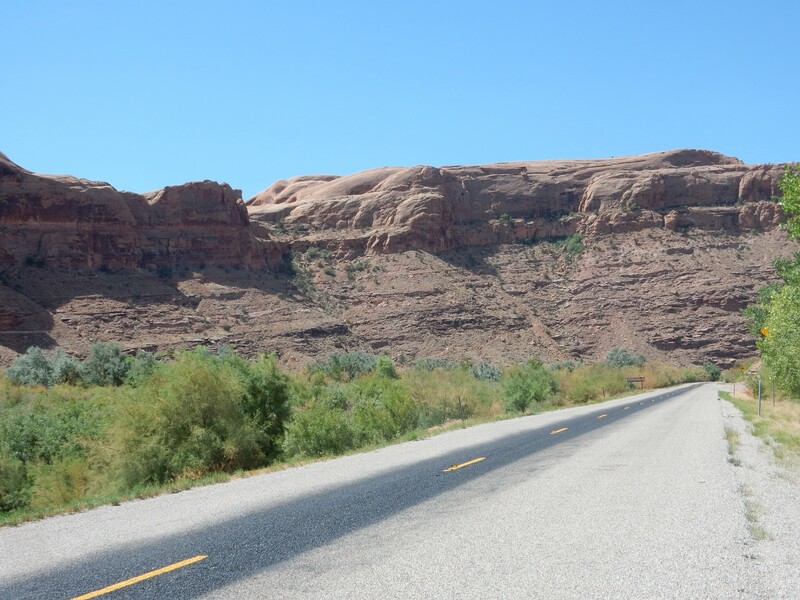 These are overlain by beds of the Triassic Moenkopi and Chinle Formation across the large canyon. 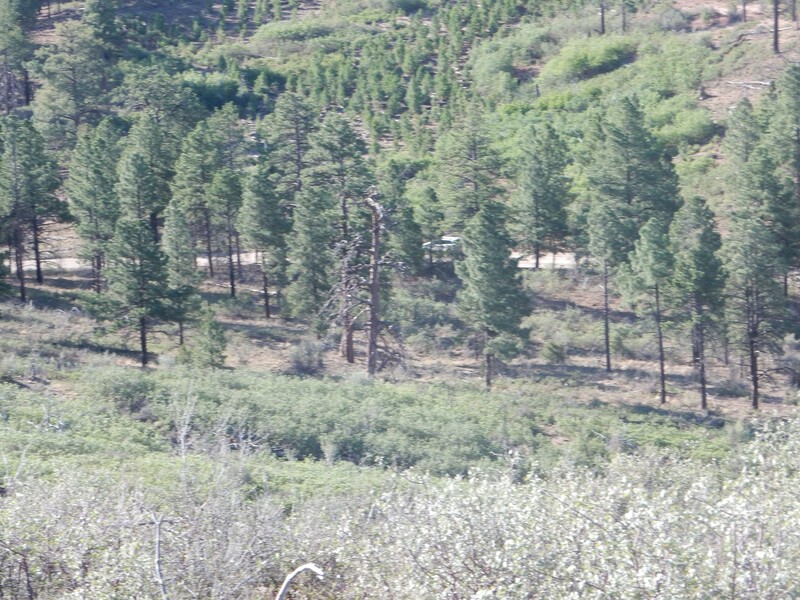 The Cutler, Moenkopi, and Chinle beds are at left; they’re all red beds and so hard to tell apart. The deeply shadowed gully at center marks the trace of the Dry Wash Fault, which turns north here. To its right are the beds I described earlier. 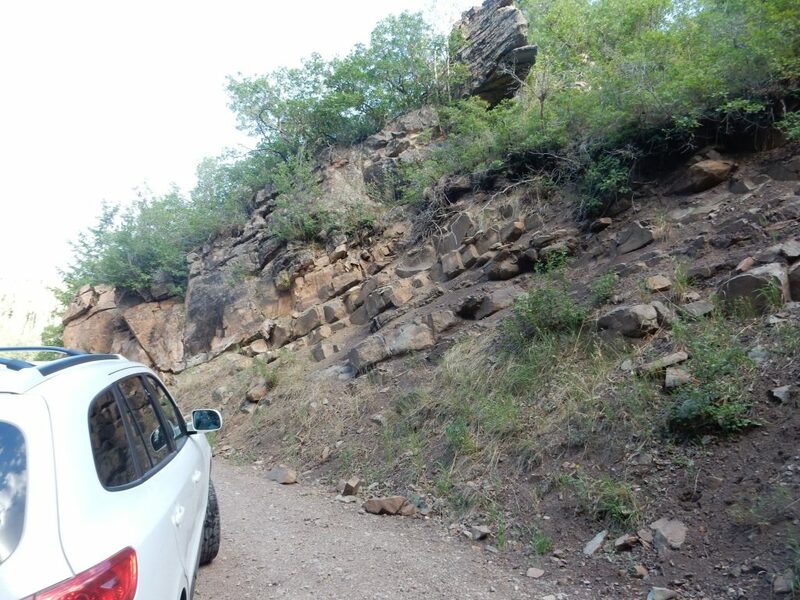 I’d like to climb up to the contact with the laccolith, because there are often interesting minerals along an intrusive contact into sedimentary rock, but that’s a very long hike and I still have a lot of driving ahead of me. I head back down. Okay, the brave little car shtick worked better with Clownie the Wonder Car, which was a Hyndai Elantra. 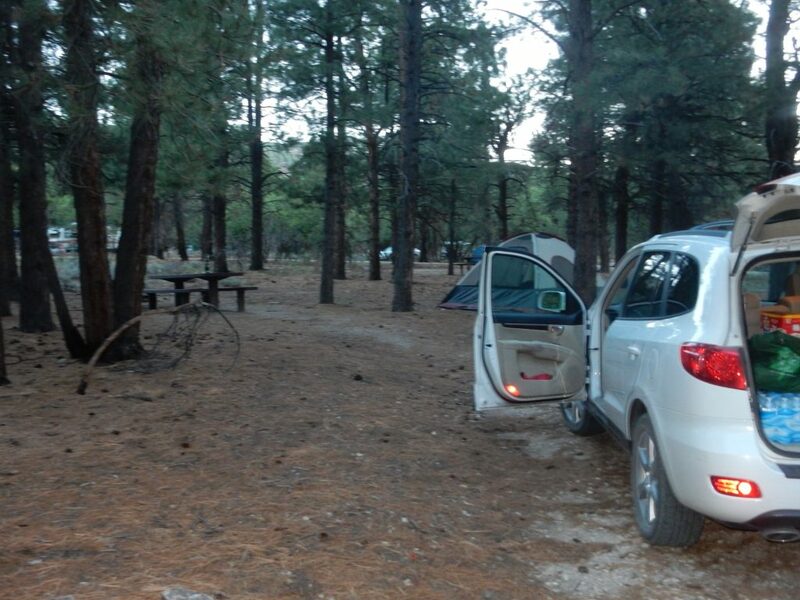 The Wandermobile, a Santa Fe, is just a little too beefy and self-confident for that. Speaking of which (this is not actually a tangent), one of the few things I really don’t like about the first Star Wars was the way Threepio looked like he was going to grow as a character in the first half of the movie, then became pure comic relief in the second half and in all subsequent sequels. I liked the Threepio rising above his nervous self on the Death Star better than Threepio the poltroon and fool. The prequels and later sequels have been mostly garbage. 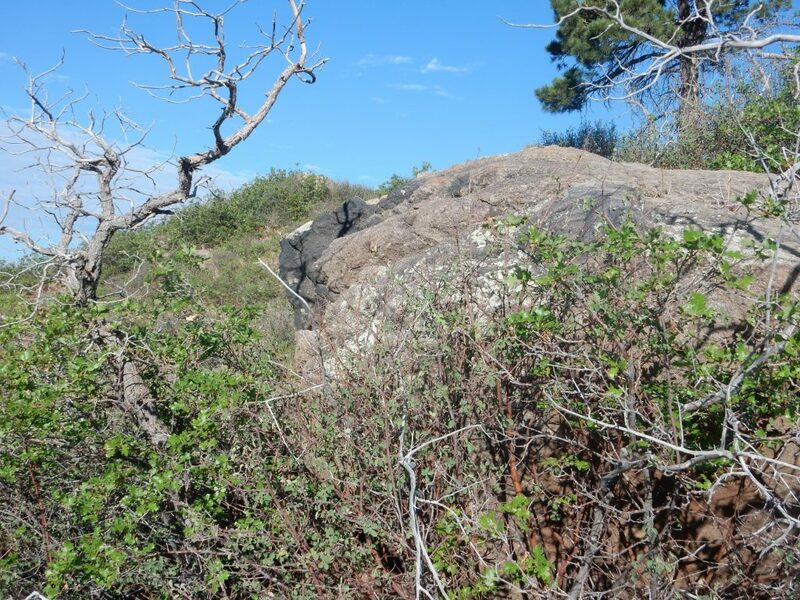 I find myself being constantly snagged by oak shrubs on the way down, nearly trippping a couple of times. I accuse them out loud of trying to kill me. The only response I get is a guilty silence. Back to the striking ledge of Moab Member. 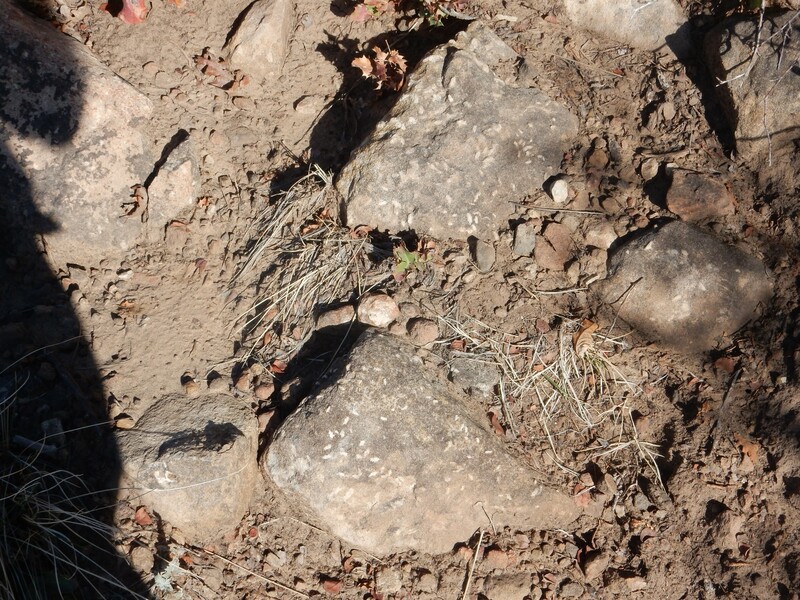 Fossils of some kind; my GPS lock chose this moment to fail so I’m not sure which formation. Fusilinids, maybe? Bruce? I arrive back at my car, having foiled the evil plans of the shrubbery, and begin my drive through the mountains to Monticello. Back to Morrison Formation in the road cut. 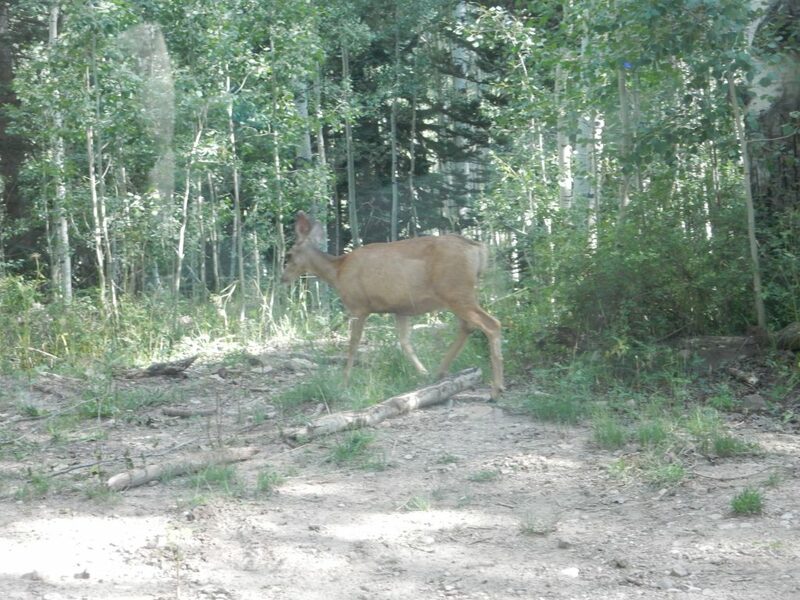 Mule deer. It’s the ears. More Morrison. 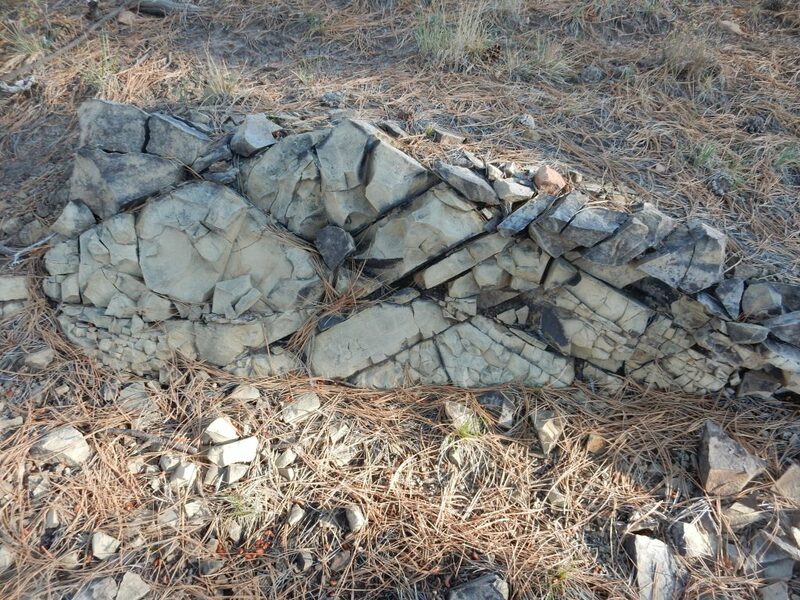 This is very close to the laccolith intrusion and looks like it has been partially hornfelsized; that is, cooked by the hot magma and partially transformed in to a dense, crystalline rock. 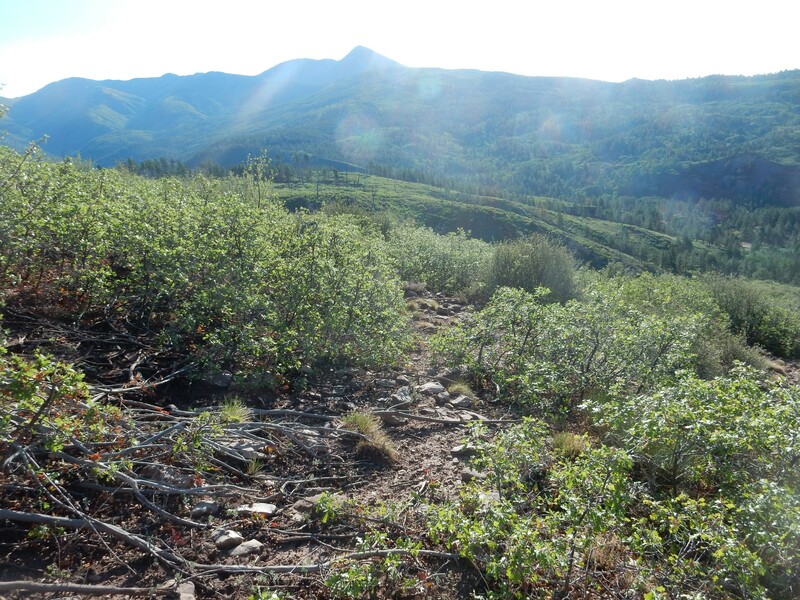 There are several prospects up slope of here — explorations for valuable minerals. It is very common to have valuable mineral deposits around the margins of a laccolith, because the hot magma “sweats” metal-rich fluids as it cools and solidifies. 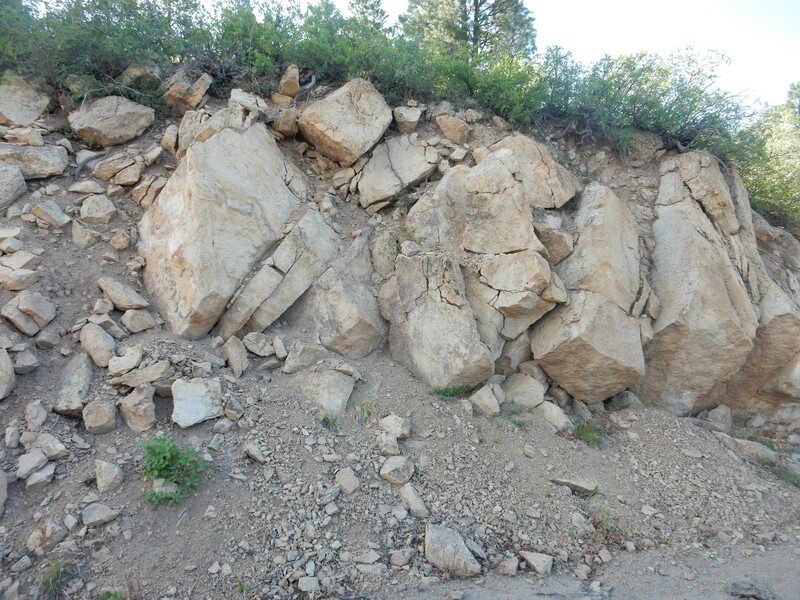 This is even closer to the laccolith margin. Across the canyon is a road cut. When I reach the cut, we’re back to unaltered Morrison Formation, though there’s laccolith diorite exposed in the hill above. The air quality is not that great (though, as it turns out, it’s the best I’ll see the rest of the trip) but you can make out white beds of the Cedar Mesa Formation in the distance to the right. The clouds and virga do not help. Finally, diorite of the laccolith itself. I’m not completely sure of the orientation, but I believe that’s Jackson Ridge to the left and Twin Peaks East to the right. 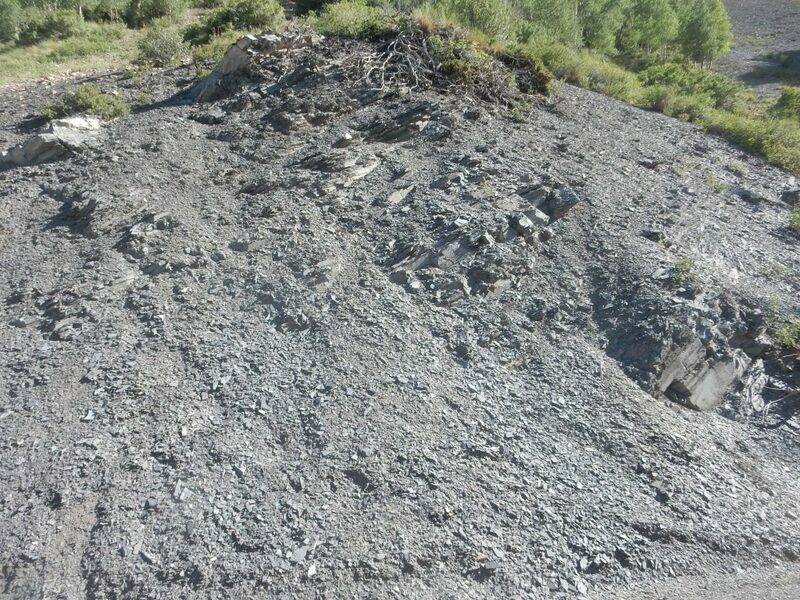 Both are diorite laccoliths with Cretaceous Mancos Formation around their lower flanks. 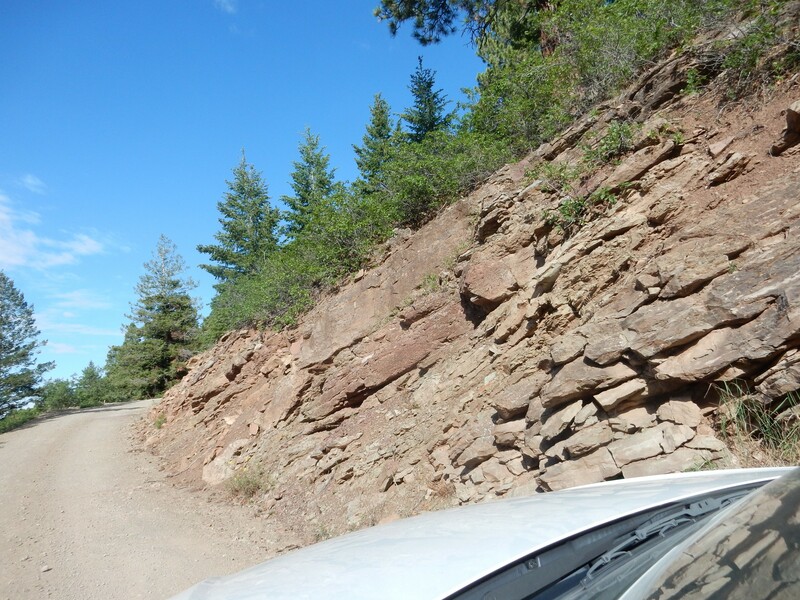 Speaking of which, I next come across an obvious outcrop of Mancos Formation. This black shale is very distinctive. 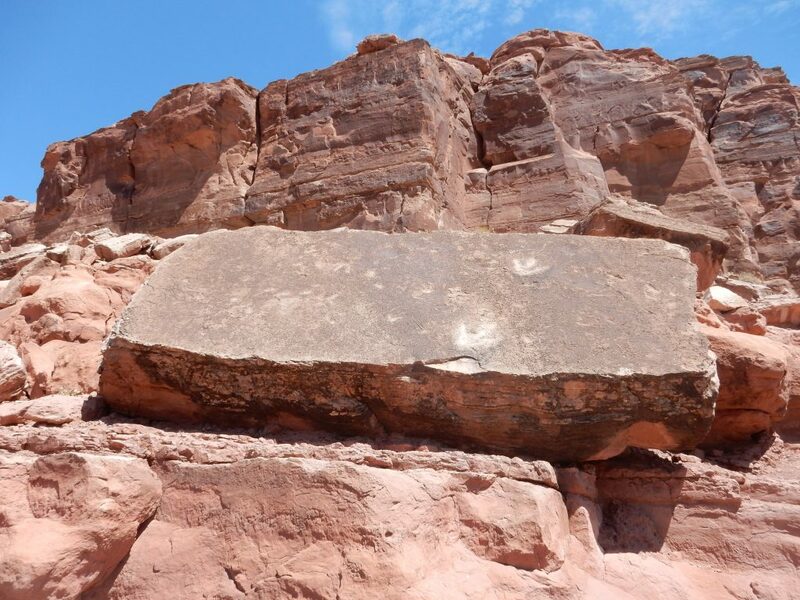 It was deposited 80 million years ago, when sea levels were the highest known in the geologic record and when mountain building in the far West created low ground to the east. 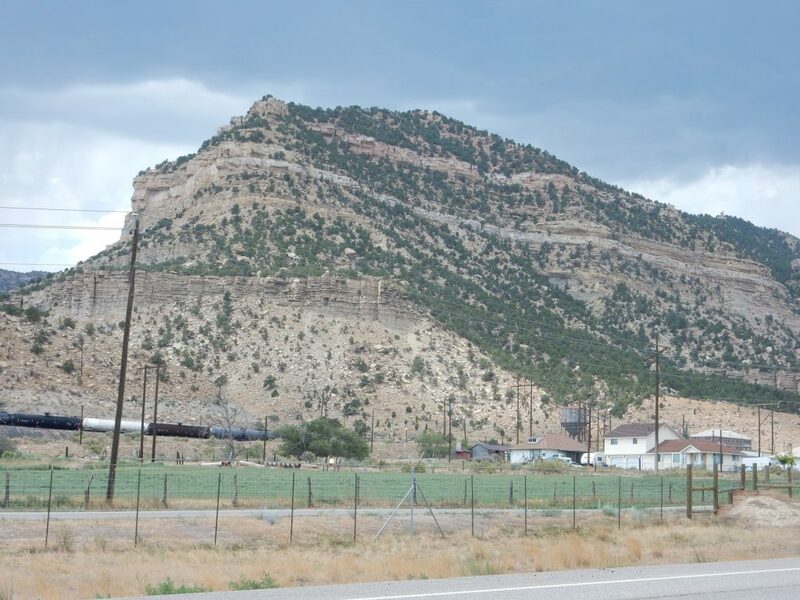 This was invaded by the sea to create the Western Interior Seaway, in which ocean mud was deposited to form the Mancos Shale. 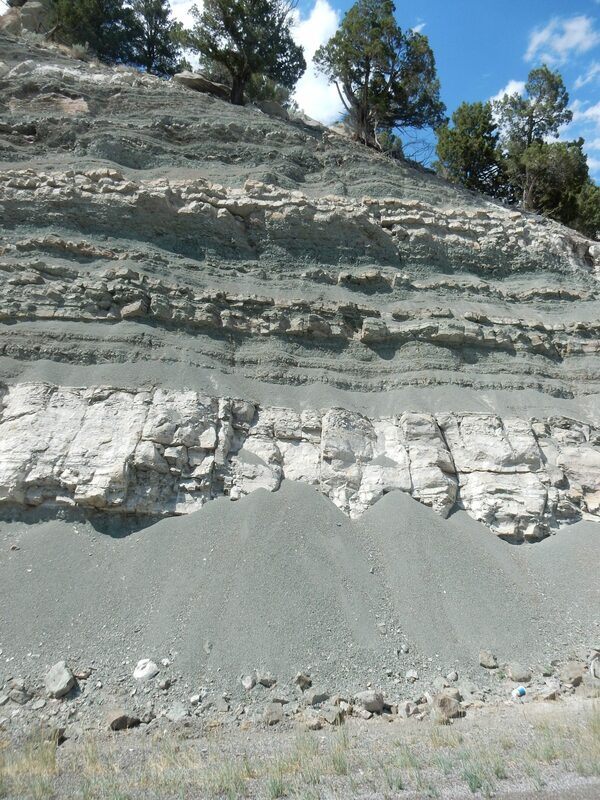 I find it interesting that the sedimentary beds appear to “onlap” onto the laccolith. 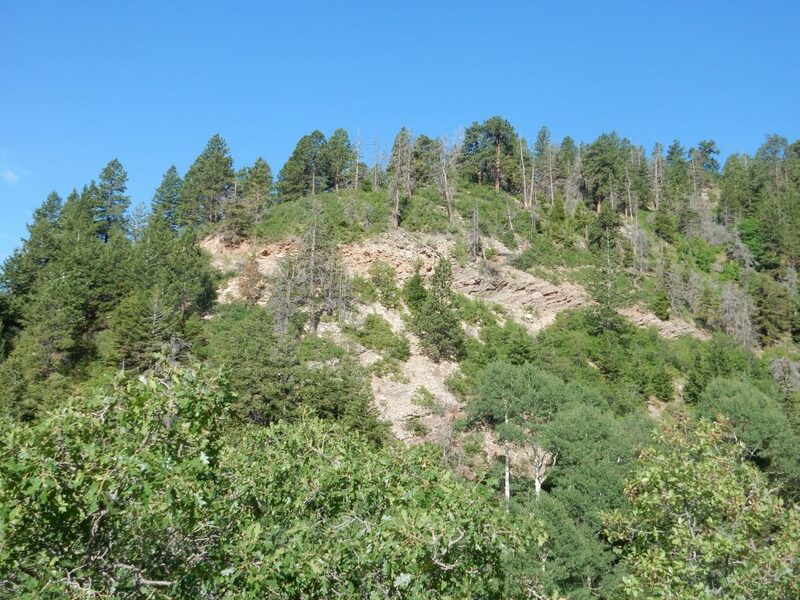 True onlap is when sedimentary beds are deposited in a sinking basin or rising sea, so that younger beds extend further onto surrounding older rock. 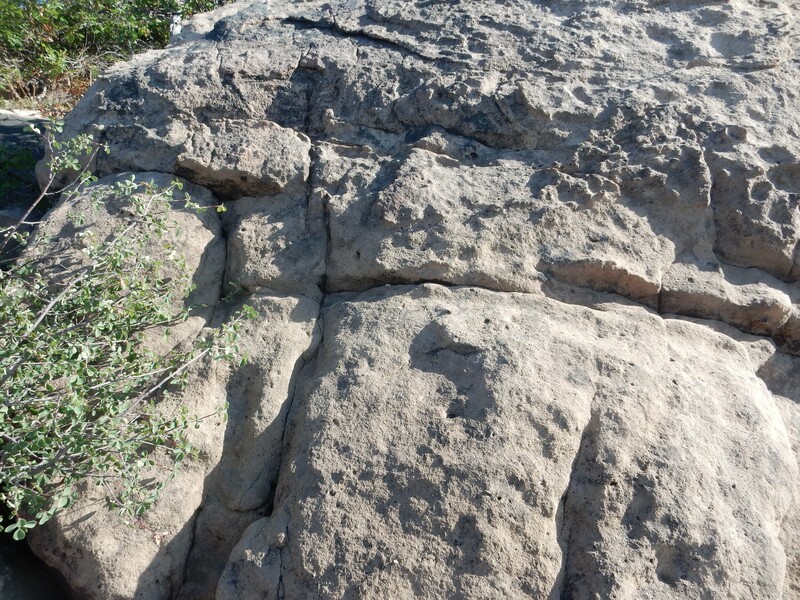 This is not the case here, where the laccolith is the youngest rock and intruded the older rock. I am not sure why progressively younger beds are in contact with the intrusion further up, unless it’s that the magma did not merely push up the sedimentary layers, but actually ate into the overlying beds, a process called stoping. It seems clear that stoping took place here. 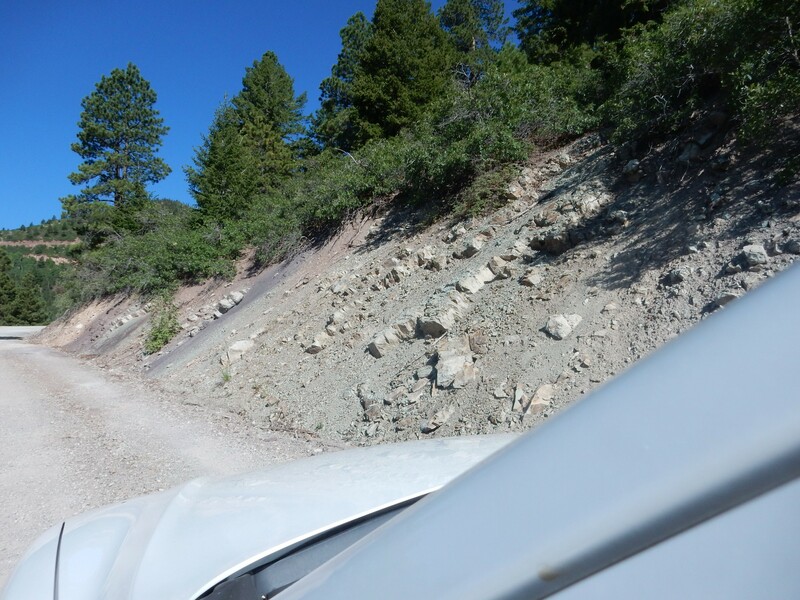 I finish my drive through the mountains, following closely behind a pickup the last part, where I am also using low gear most of the way. 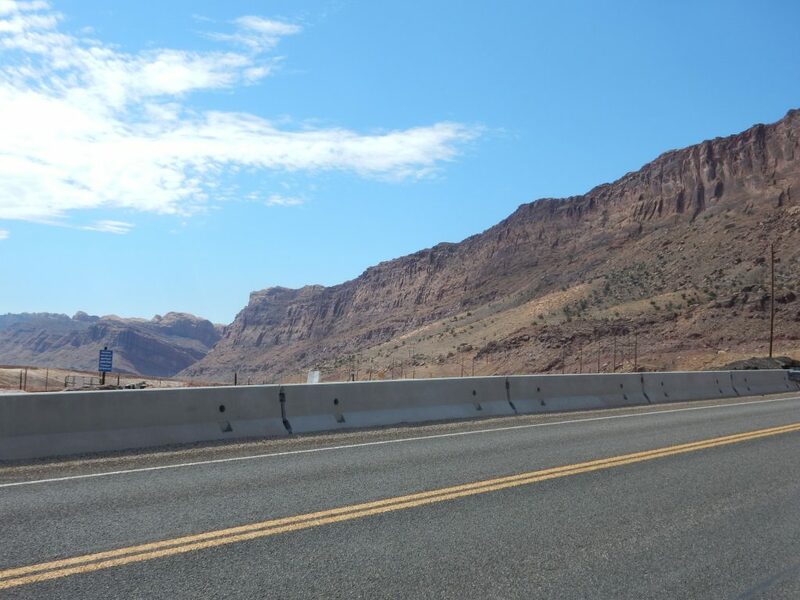 I refuel in Monticello; drive north to Moab and make another stop, to buy some oranges for my morning snack; and then take the Potash Highway. This is a drive highly recommended by my road log. 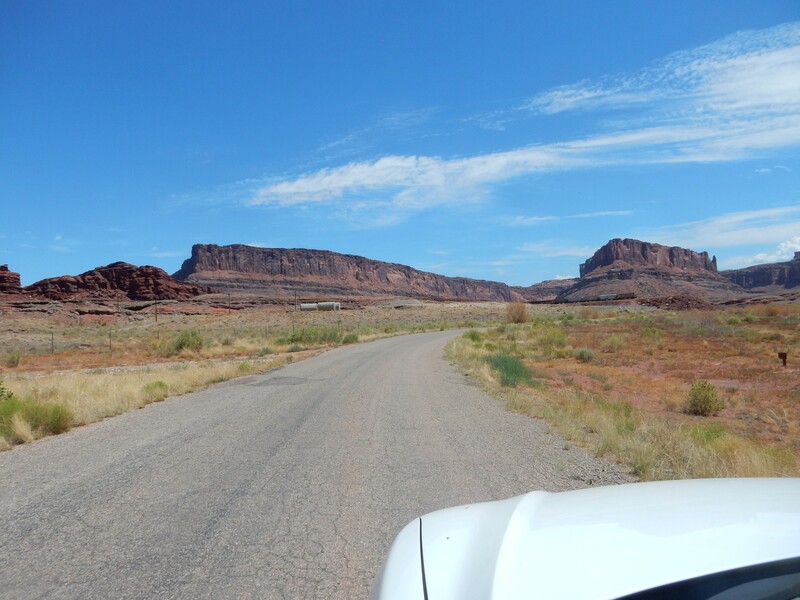 It terminates on Island in the Sky in Canyonlands National Park, after traversing a significant length of dirt road. 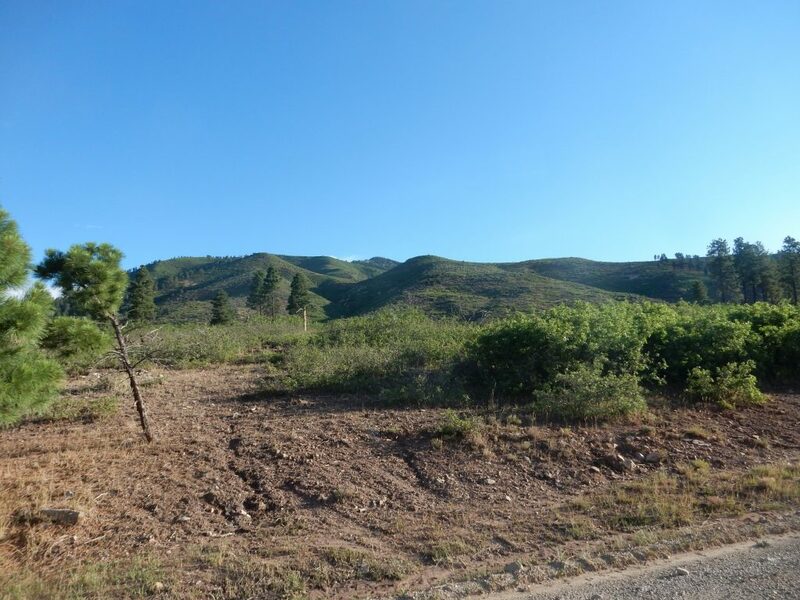 My guess is that the road is good enough for my car, but I’m worried about time; the drive through the Abajo Mountains after an hour hike was time consuming. I decide I’ll scout down the road as much as time allows, and at least see if the gravel portion starts out as a decent road. Across the Colorado River as it enters Kings Bottom, there is an angular unconformity in the mesa beds. 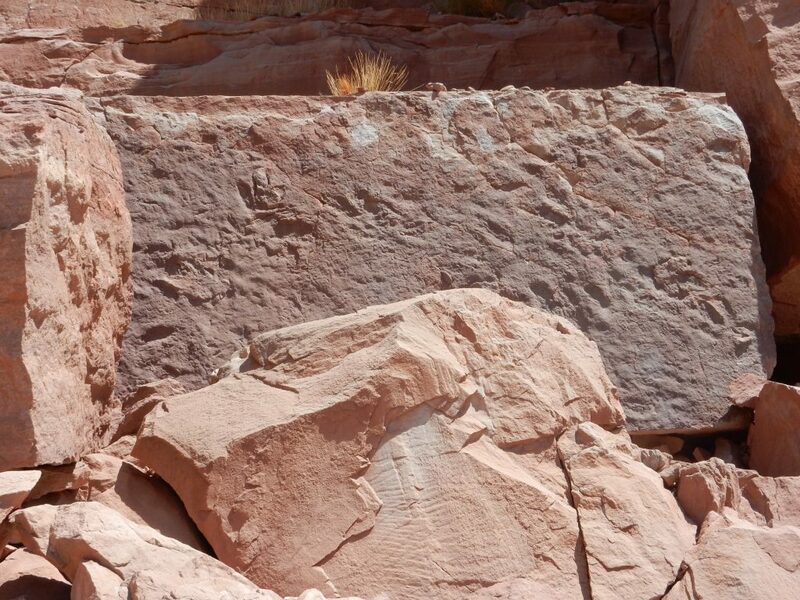 The beds at bottom that plunge almost vertically into the ground, and meet the overlying beds at an angle, are within the Chinle Formation, and show that there was significant folding of beds in this area even as the formation was being deposited. 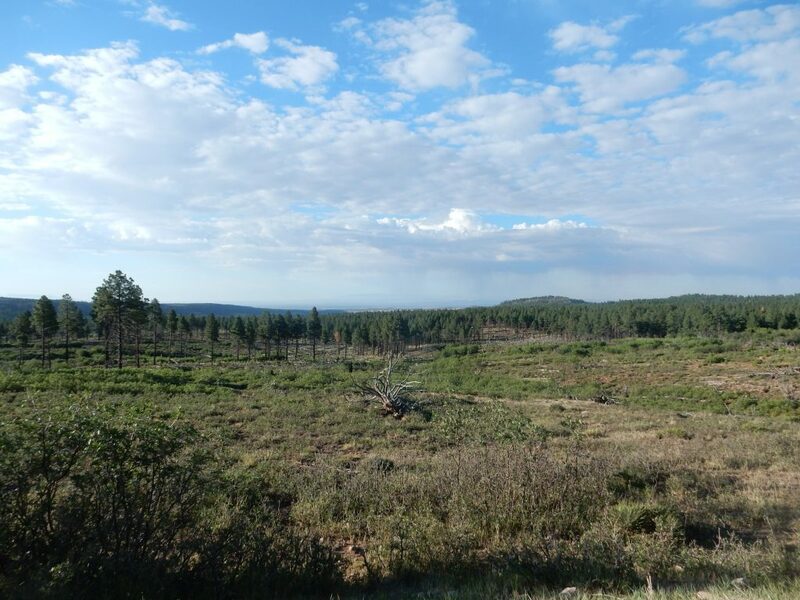 This entire part of the Colorado Plateau overlies the ancient Paradox Basin, formed around 320 million years ago when Africa collided with North America and threw up what geologists call the Ancestral Rocky Mountains. (These were later beveled flat by erosion, but the Rocky Mountains we know were thrown up in about the same location 240 million years later.) When mountains are thrown up, deep basins sometimes form alongside ranges, and the Paradox Basin was one. It was initially filled with seawater, and prolonged evaporation of sea water entering the basin deposited great thicknesses of salt. This was later covered with sediments eroded off the Ancestral Rocky Mountains. However, salt is light and relatively soft, and it flows like soft plastic under pressure beneath the earth. Here it began flowing in large ‘salt walls’ towards the surface even as more sediments were being laid down, and many of the valleys in this area reflect ‘salt walls’ coming near the surface only to be dissolved away by ground water, causing the overlying beds to collapse. Moab Valley is such a valley, as are Salt Valley and Cache Valley in Arches National Monument. 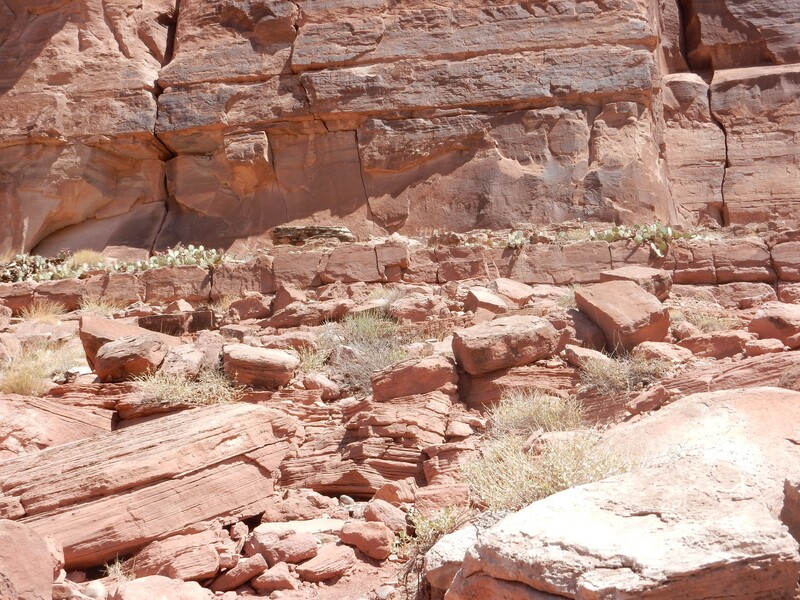 The geology is typical of the Canyonlands area. The thin beds at the bottom of the mesa at left are Triassic Chinle Formation beds, laid down by the mighty Chinle River 210 million years ago. Above is a massive bed of the Jurassic Wingate Sandstone, deposited as a dune sea. Then come more thin beds of the Jurassic Kayenta Formation, laid down in a system of rivers and creeks, and finally massive beds and knobs of Jurassic Navajo Sandstone, also laid down in a dune sea, atop the mesa right of center. 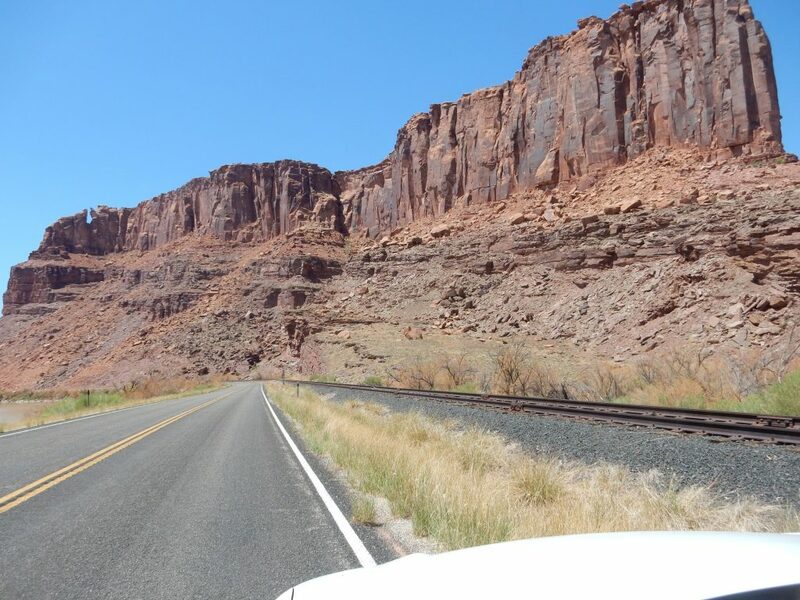 Further down the canyon, we enter a shallow syncline, a dip the structure of the Earth’s crust, and only the Kayenta Formation and Navajo Formation are visible. 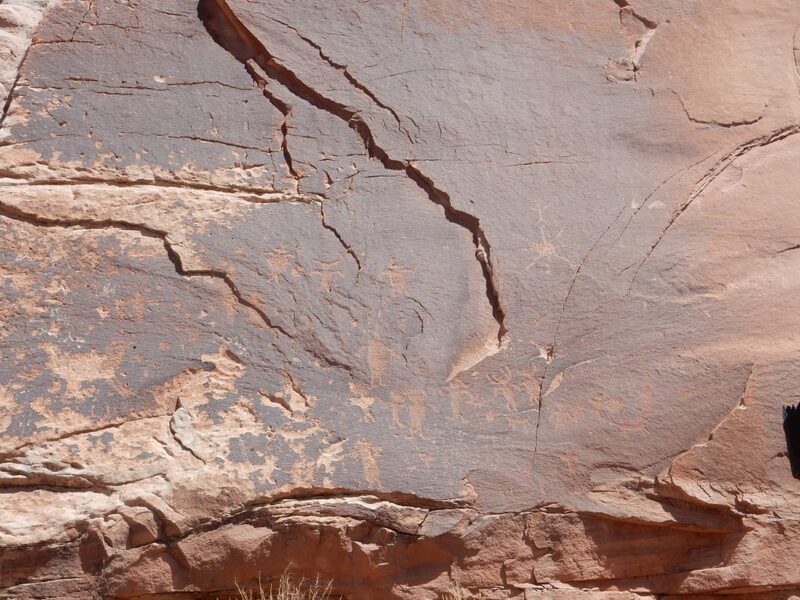 I see a sign to the right advertising dinosaur track and petroglyphs. I reflect: There’s no time to do these and also drive to Island in the Sky. On the other hand, it’s getting late as it is. I make a choice. 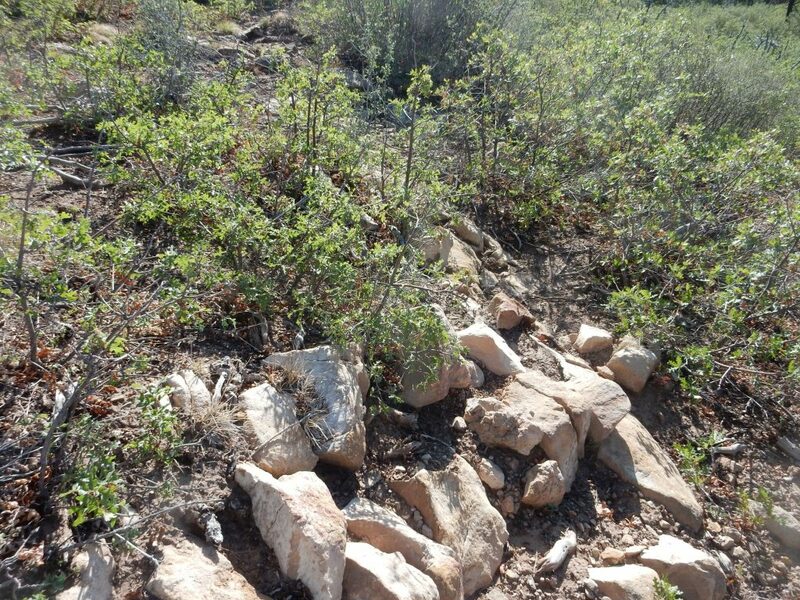 The trail is clear at first, but soon there is nothing but the occasional rock cairn or trail sign. But there are, indeed, dinosaur tracks here. Besides the two large and obvious tracks, there are a number of smaller tracks; two dinosaur species crossed this sand bar before it was buried by more sediments. I scout around for more tracks, but these are the only ones I find here. 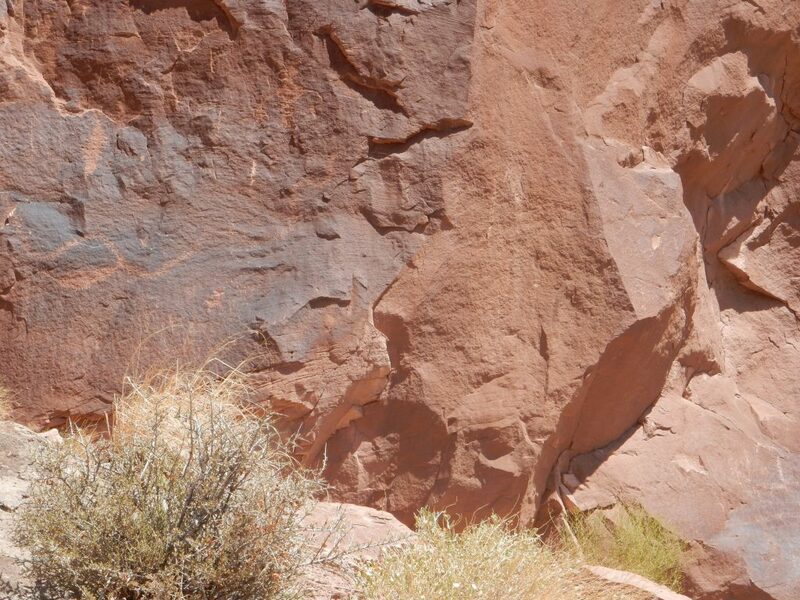 However, there are petroglyphs visible on the face of the mesa, and I clamber up. 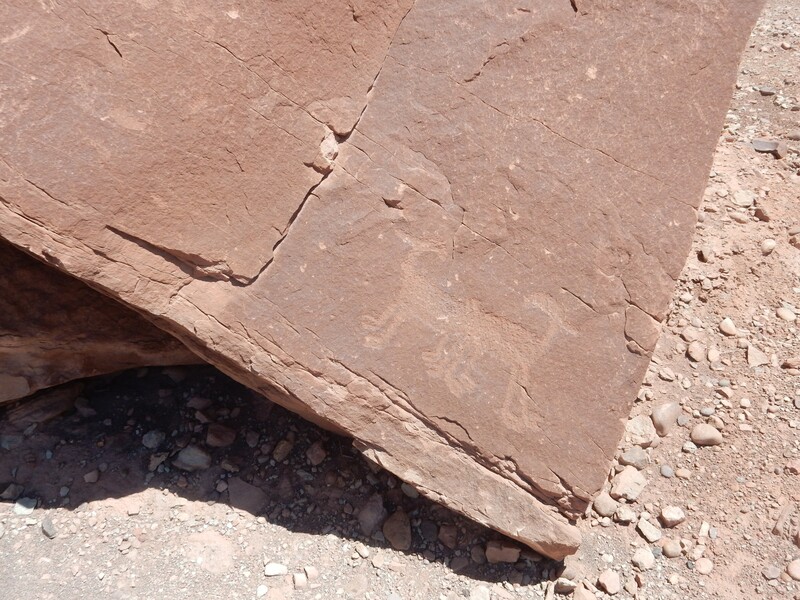 Some particularly thinly bedded Kayenta Formation. A row of ceremonial dancers? 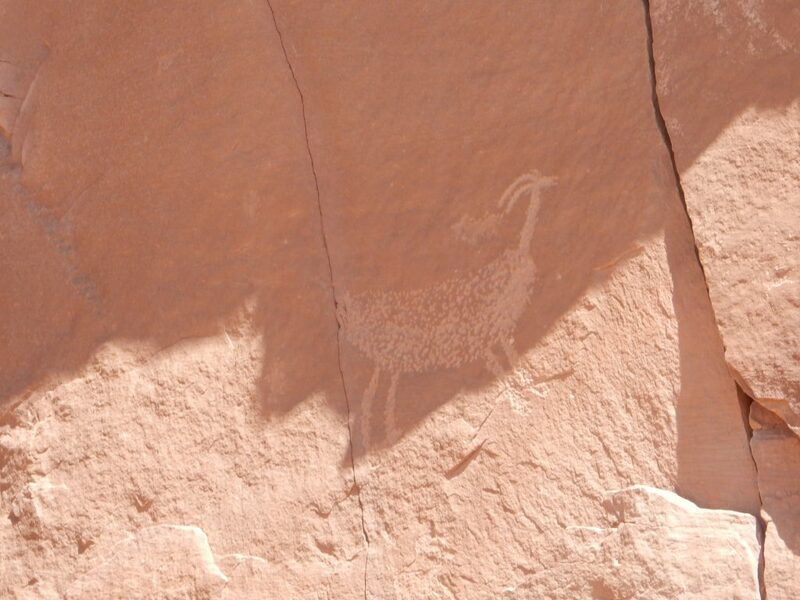 Well, this area is known for uranium, but after examining other examples, I conclude it’s meant to be two mountain goats standing side by side. It seems to be a common motif here. 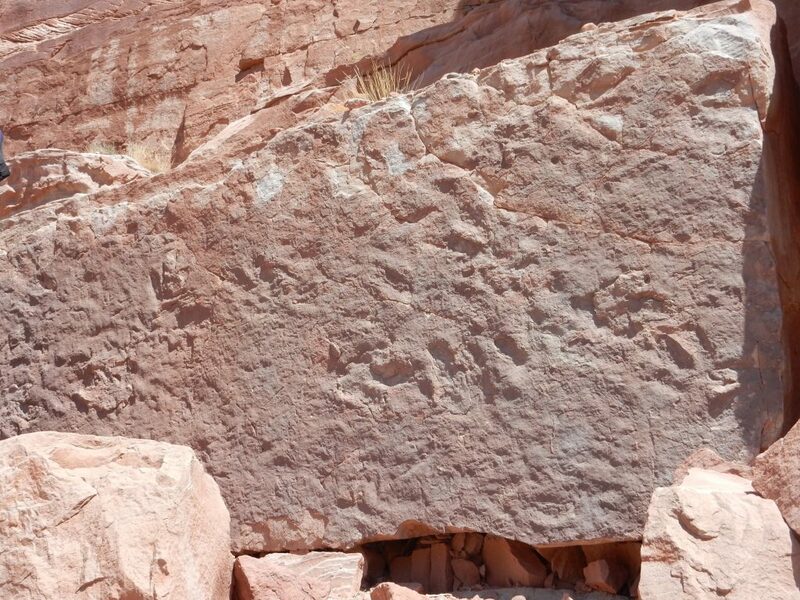 I come across another slab with dinosaur tracks. The light is not quite right for photographing them well. A young family is coming the other way. The father walks onto the track boulder, looks around, and wonders out loud where the dinosaur tracks are. I tell him he’s standing on them. He looks down sharply and I clarify. His smiling daughter, who looks to be about 13, is looking for a way down to where I am looking at the tracks. I’m not worried about the daughter; she’s young and agile. The parents, not so much, and the dog, a Malamute cross, looks like he is about to expire from the heat. “Who’s d— idea was it to bring the dog, anyway?” the father mutters. I offer some advice on how to get to the dinosaur tracks. The sun has shifted just enough to bring out the tracks on the one slab. 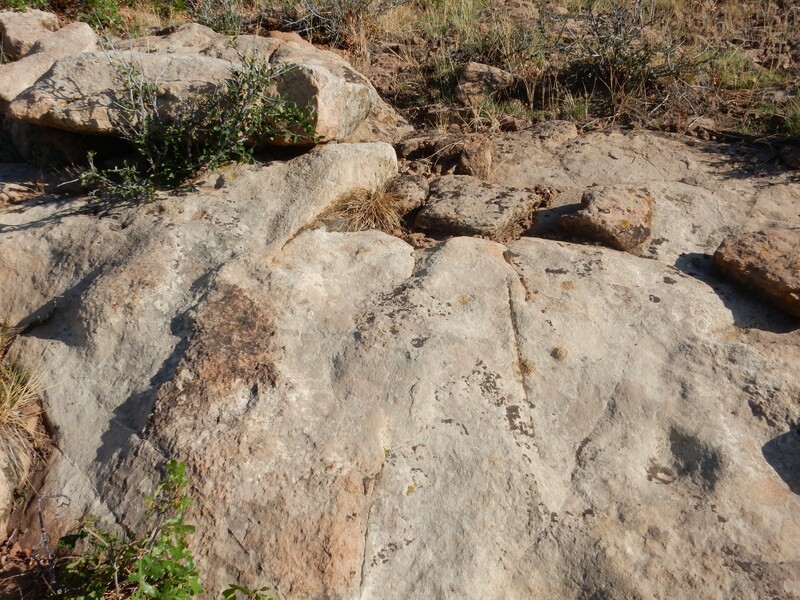 There are also sole marks on the foreground boulder — the horizontal ridges. Formed when water runs across a bed of still-soft sediment. The young family are still struggling with their dog. I suggest a path to take. The father picks up and carries the poor beast the rest of the way down the trail. I wait long enough to see that they’ve got back safe to their car and are giving the dog a big bowl of water. It’s like a blast furnace out here. 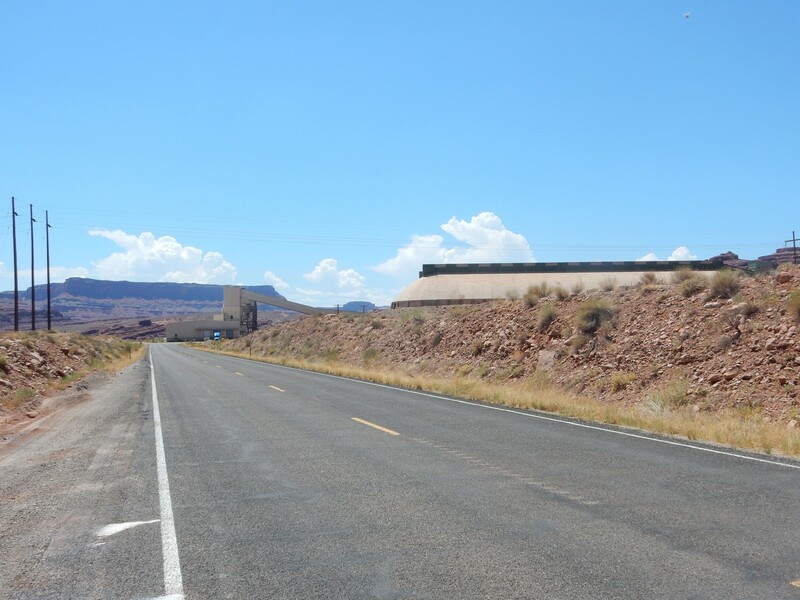 I continue along the road, which continues to follow the rough level of the Kayenta Formation. Then the canyon begins to cut down to older beds again. The Wingate Formation reemerges. 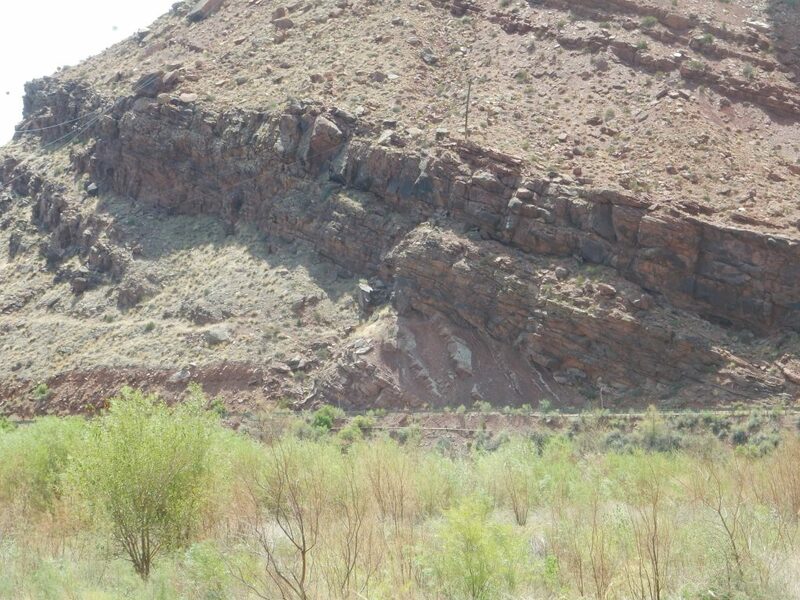 and below the Chinle, the characteristic chocolates beds of the Triassic Moenkopi Formation. This was laid down in vast tidal flats along what was then the west coast of North America. 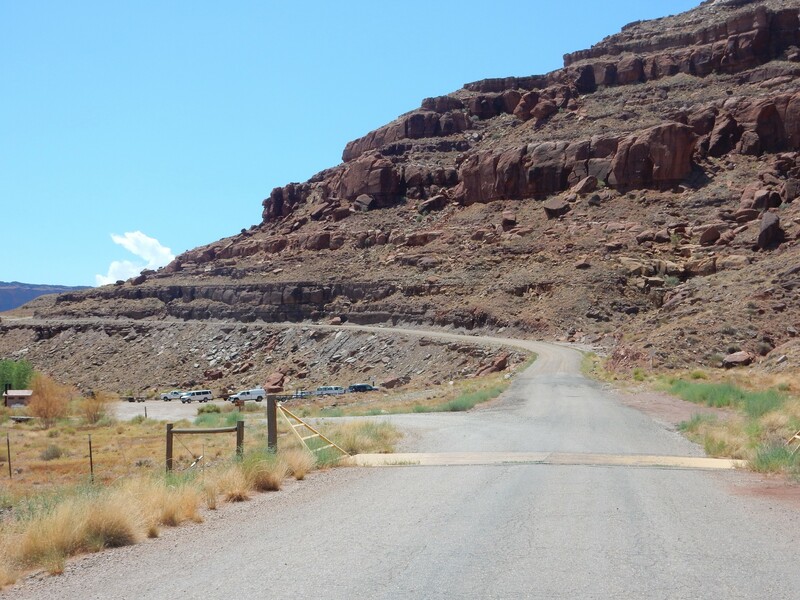 I reach the Potash boat ramp and the end of the paved road. The beds here are Permian Cutler Formation, the next oldest formation. These are thick beds of sediment eroded off the young Ancestral Rocky Mountains. Well, I’ve seen the gravel road. It’s a good gravel road here. I may try driving it to Island Park next time I’m here. But I don’t have time today. I turn around. 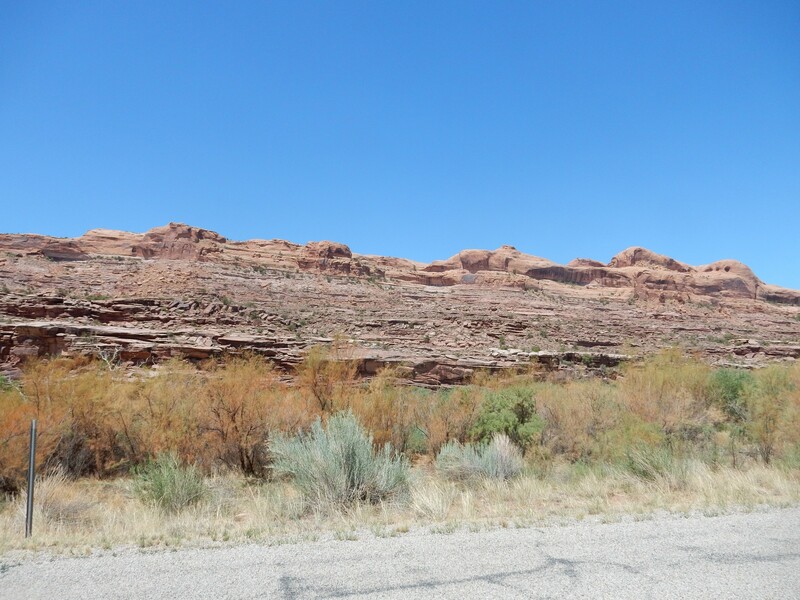 A particularly beautiful mesa underlain by upper Cutler Formation. 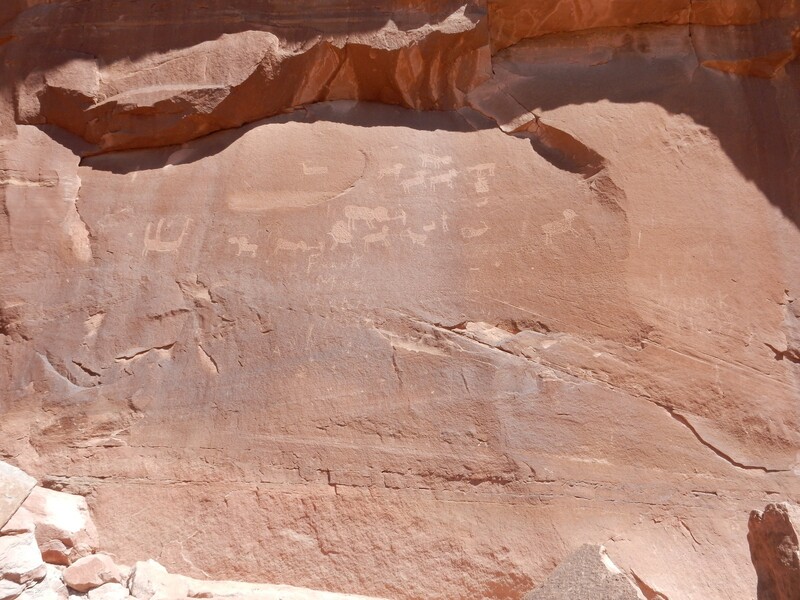 Mesas showing the whole sequence from Cutler through Moenkopi and Wingate to Kayenta Formations. Looking back the the actual potash plant for which this route is named. Panorama of lower Kings Bottom Canyon. 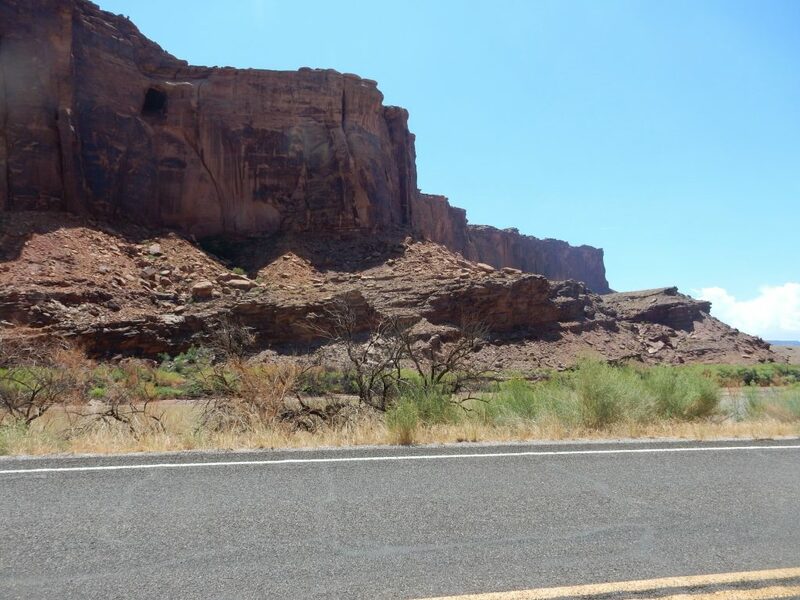 At right, the mesa exposes Cutler Formation at its very base, then the (lighter in appearance, at this sun angle) Moenkopi Formationk, then Chinle Formation, then massive beds of the Wingate Formation, and a thin cap of Kayenta Formation at top. I return to the vicinity of Moab and head north, after eating lunch along one of the tourist pullouts. This is all familiar ground, but I notice something new at one point. 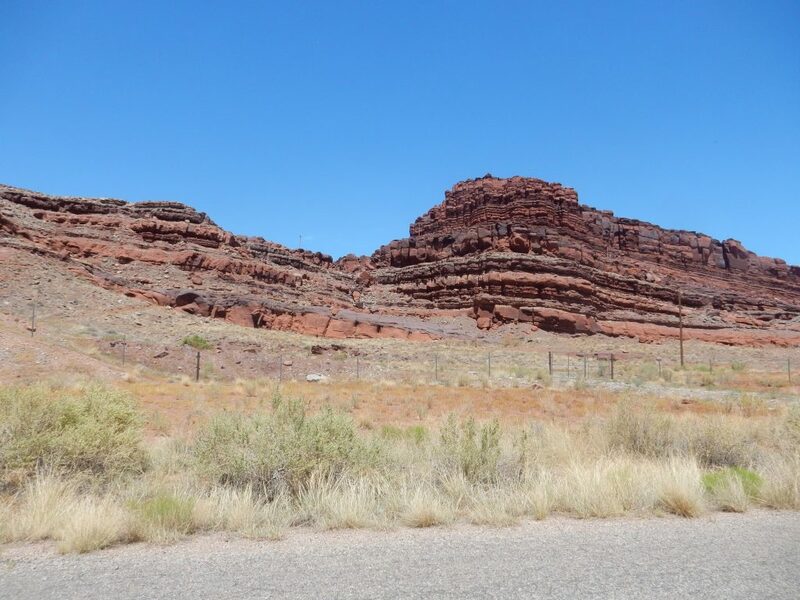 The mesa at left is capped by the familiar combination of massive Wingate Formation topped with thin beds of Kayenta Formation. 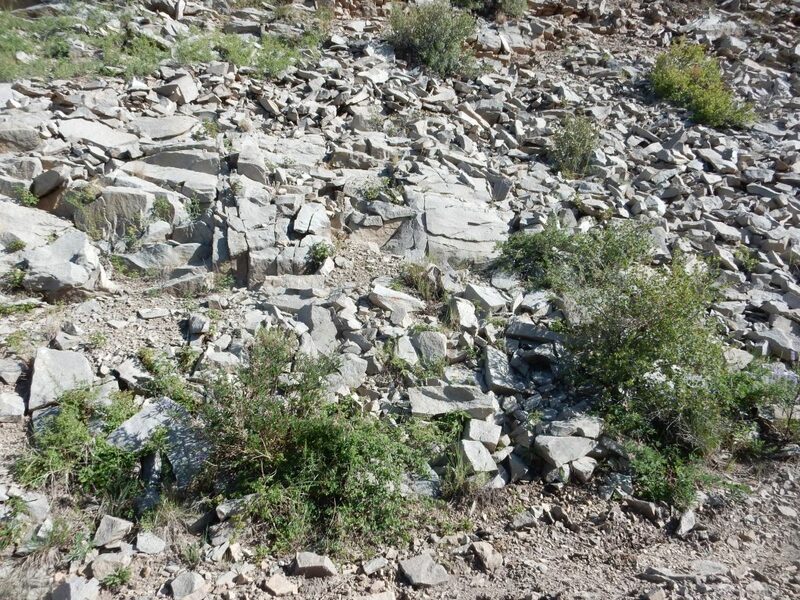 But to its right, there are greenish beds that look like Morrison Formation, which is much younger. The geologic map confirms that this is indeed Brushy Basin Member of the Morrison Formation, overlaid by more drab beds of the Cretaceous Burro Canyon Formation and a cap of resistant Dakota Formation. 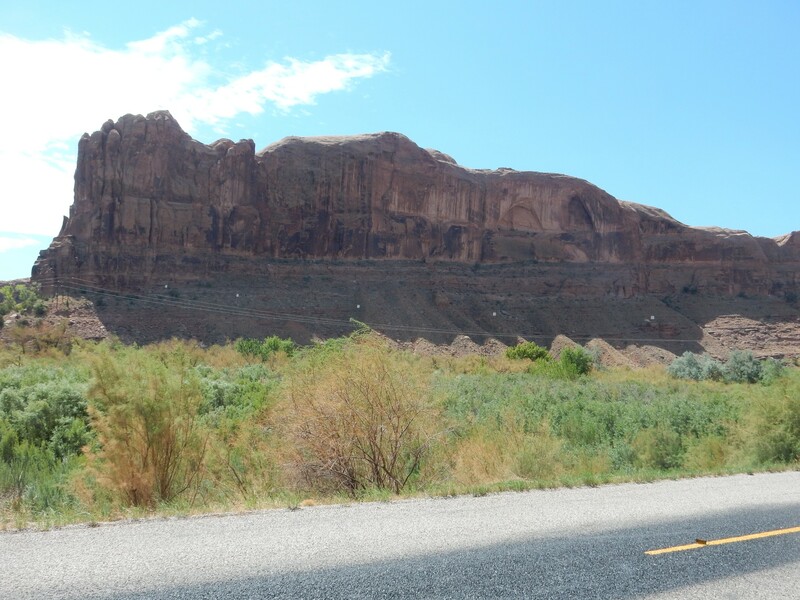 Between the two, at the shoulder of the mesa, is the trace of the Moab Fault, which throws down all the beds to the northeast (right in the photograph). 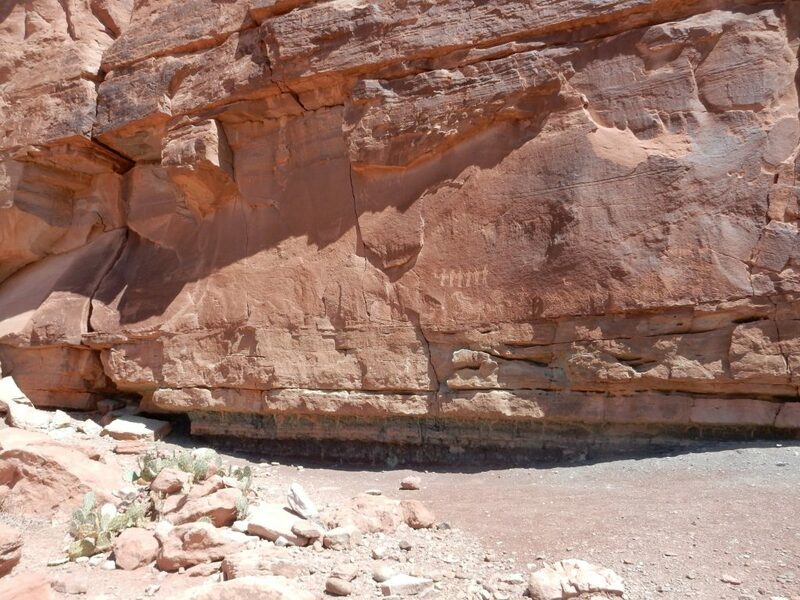 This fault marks the southwest limit of an underground ‘salt wall’ of the Paradox Formation whose upper beds were dissolved away by ground water, causing the overlying beds to collapse and form Moab Valley, from which I am just emerging. 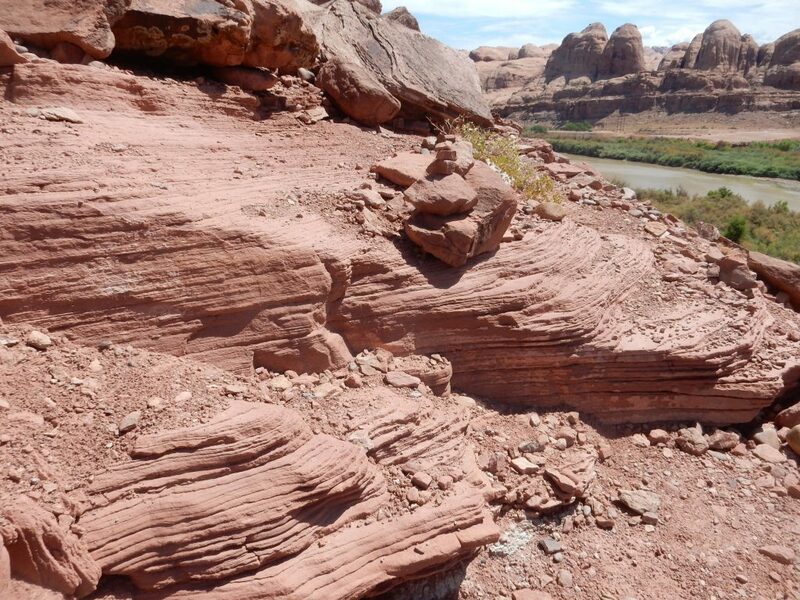 The young beds are warped gently upwards, probably as part of the Moab Anticline. 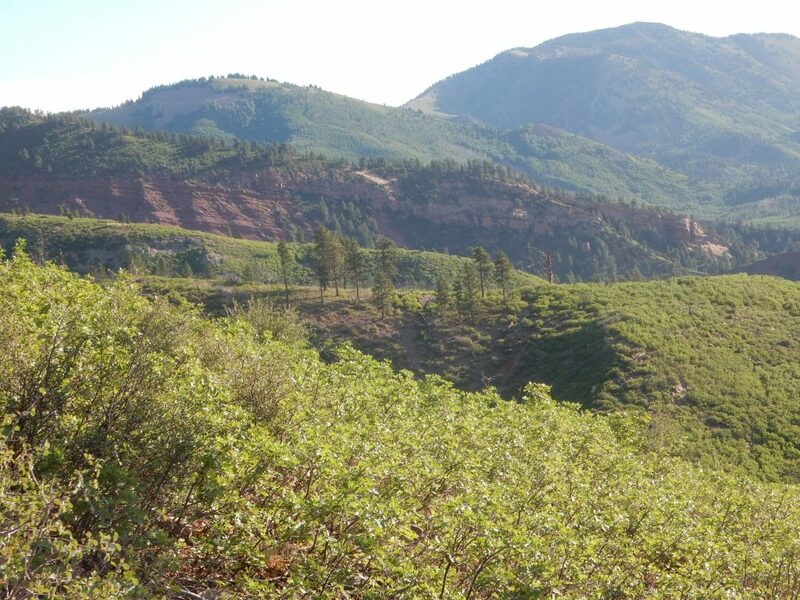 If you follow then to the east, you find there is a low point approximately where the road is headed — the Courthouse Syncline — and then the beds tilt upwards again, revealing another characteristic green exposure of Brushy Basin Member right of center in the photograph. Beyond that, the young beds have been eroded away to expose older beds. The grayish beds below the greenish beds, visible just right of center, are the Salt Wash Member of the Morrison Formation. The pinnacles beyond and to the right are eroded from the Moab Member of the Curtis Formation. The Summerville Formation is intermediate in age between the Curtis Sandstone and the Morrison Formation, but it is a very soft formation and has been eroded off the Curtis and is exposed only along an arroyo on the west side of Salt Valley, which lies between the foreground bluffs of Morrison Formation and the background pinnacles of Curtis Formation. Just visible on the skyline at far right is the Devils Garden area of Arches National Monument. 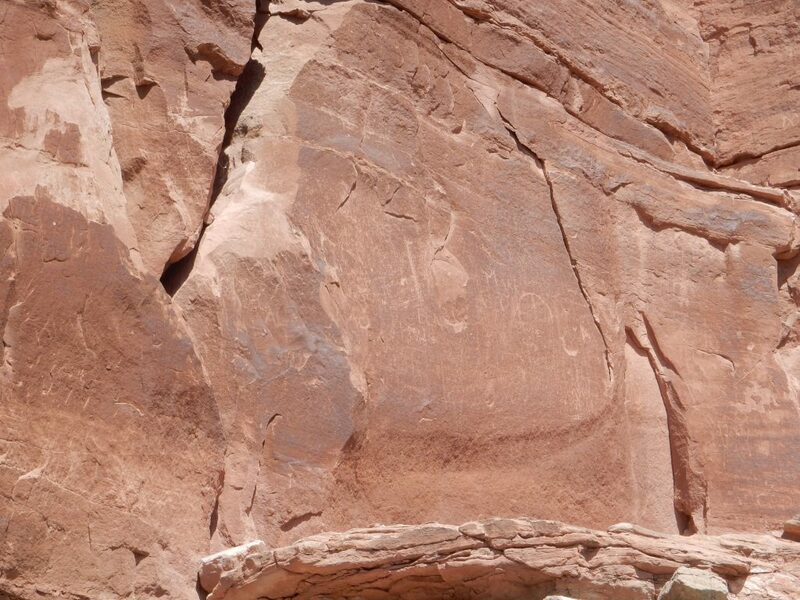 This is eroded from the Curtis Formation and the next older formation, the Entrada Formation, though probably only the portion in the Curtis Formation is visible over the crest. Still further north, the road passes west of the Arches Anticline. This extends southeast into Arches National Monument but is not as obvious there. 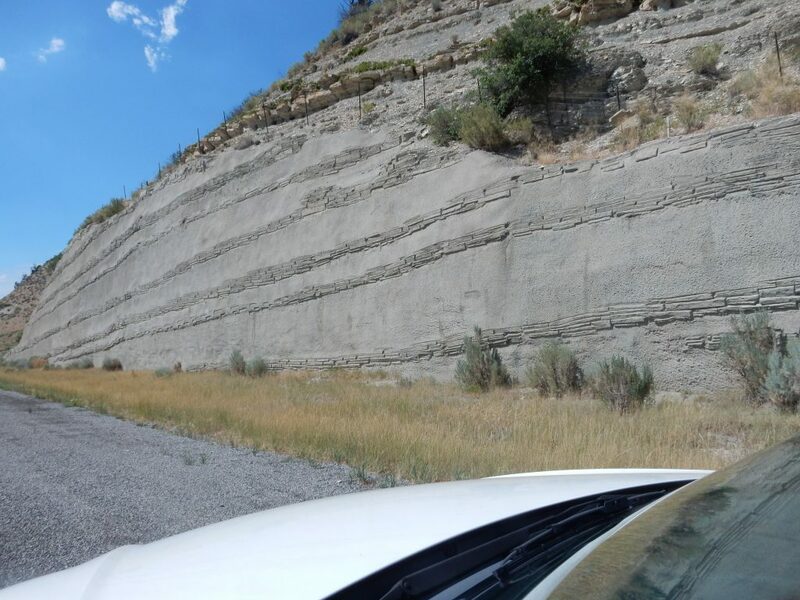 Here the Arches ‘salt wall’ pushed up the overlying beds into an anticline before being dissolved by groundwater, causing the crest of the anticline to collapse to form Cache Valley and Salt Valley. From here we’re seeing the west side of the anticline. 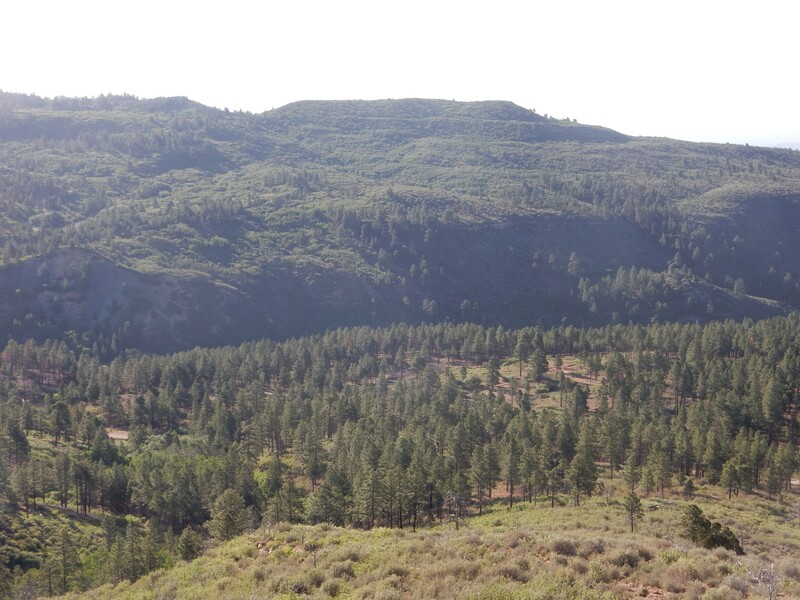 At left, the anticline is capped with resistant Dakota Formation over softer Cedar Mountain Formation, which replaces the Burro Canyon Formation north of Arches. Under this are poor exposures of Brush Basin Member. Both are eroded off the more resistant Salt Wash Member of the Morrison Formation on the right side of the photograph. It is interesting that the Salt Wash supports considerably more vegetation than the younger beds to its left. and the Book Cliffs to the east. 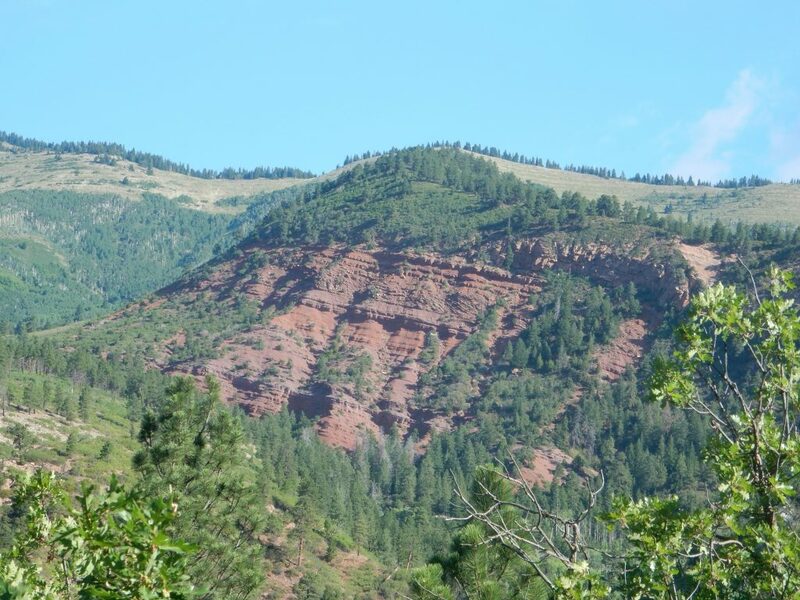 In a stunning coincidence, there are exposures of Cedar Mountain Formation at Cedar Mountain, which are Cretaceous beds around 120 million years old. The Book Cliffs are younger formations around 70 million years old. 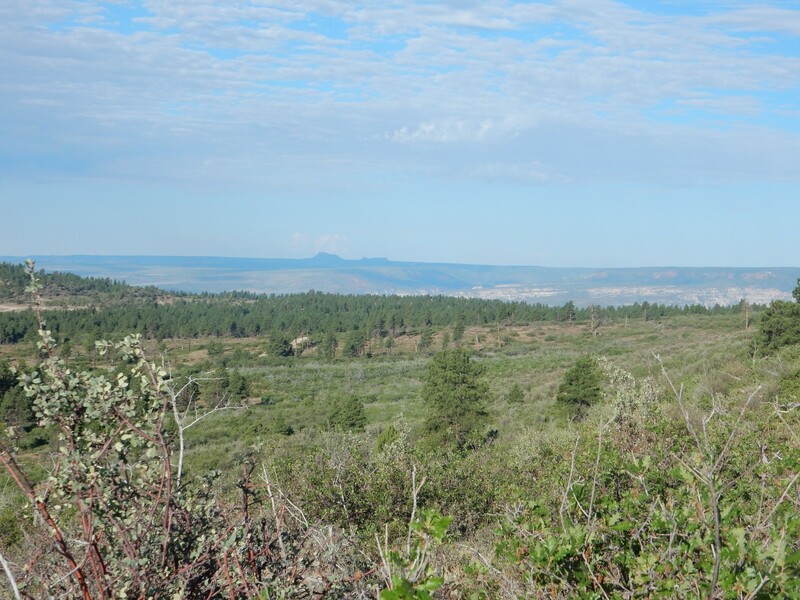 The valley I’m crossing — Clark Valley, if I’m reading the map right — is underlain by the Mancos Formation, intermediate in age at 80 million years. This formation also underlies the lower slopes of the Book Cliffs and accounts for the cliffs: You tend to get dramatic cliffs when a resistant rock bed (here, the Mesaverde Group) lies over very soft beds (here, the Mancos Shale). From there through Price and Helper. So many beds here. The upper part is the Cretaceous Blackhawk Formation of the Mesaverde Group. The Mesaverde represents a regression-transgression sequence, where the shallow ocean that deposited the Mancos Shale, the Western Interior Seaway, briefly retreated off the continent (a regression.) This left a layer of beach sand, then swamp deposits behind the beach, then another layer of beach sand as the sea returned (a transgression). Coal is common in the swamp beds and is mined in this area, as well as back home around Madrid. 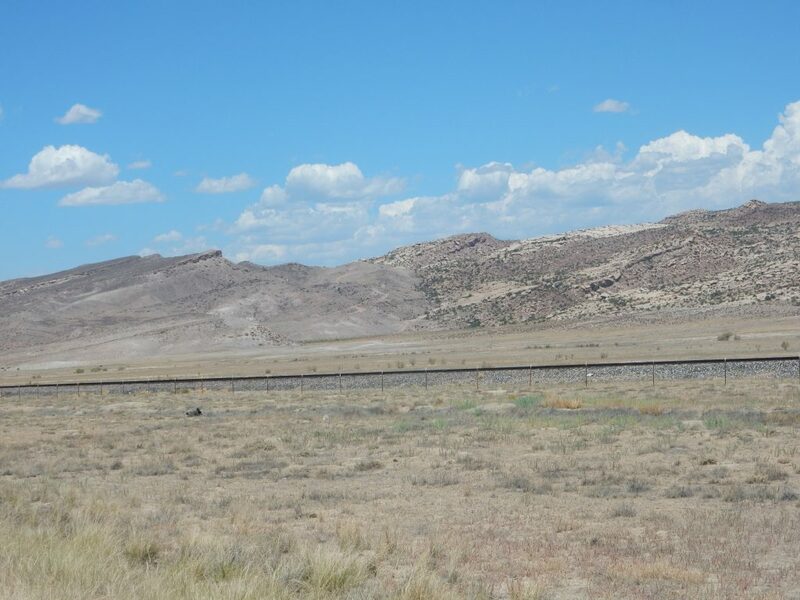 In New Mexico, the retreating beach sand is assigned to the Point Lookout Formation, the swamp beds to the Menefee Formation, and the returning beach sands to the Cliff House Formation. I don’t know the assignments here. 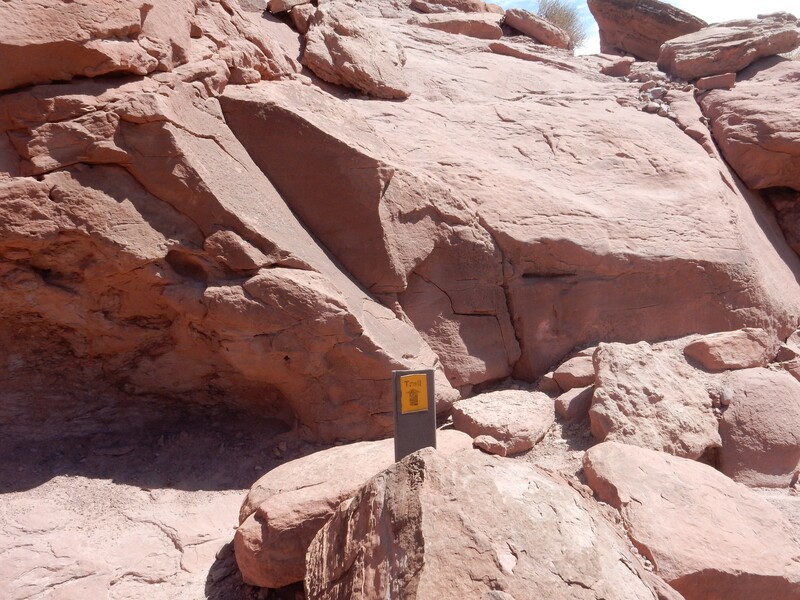 The prominent thin bed halfway down the mesa (not the one towards the top) may be the Star Point Sandstone. My map is a bit vague. The lowermost slopes are the Blue Gate Member of the Mancos Shale from before the regression-transgression sequence. Some distance up the canyon, a thunderstorm breaks and the rain pours down. I decide that sudden hydroplaning while your emergency skid control and your cruise control fight each other is an unpleasant character-building experience. I’ve seen and photographed much of the canyon before, but I cannot not resist this. This is the delta facies of the Eocene Green River Formation. 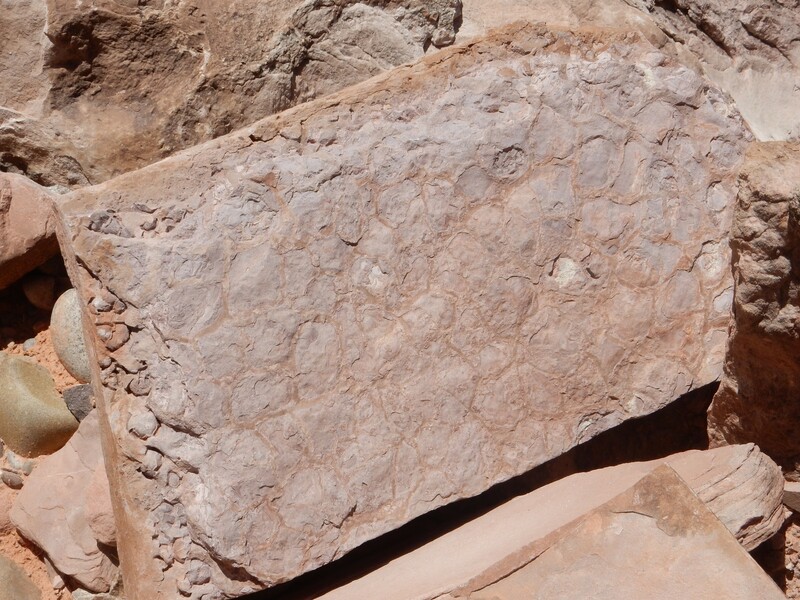 This formation was laid down in a vast freshwater lake around 50 million years ago. 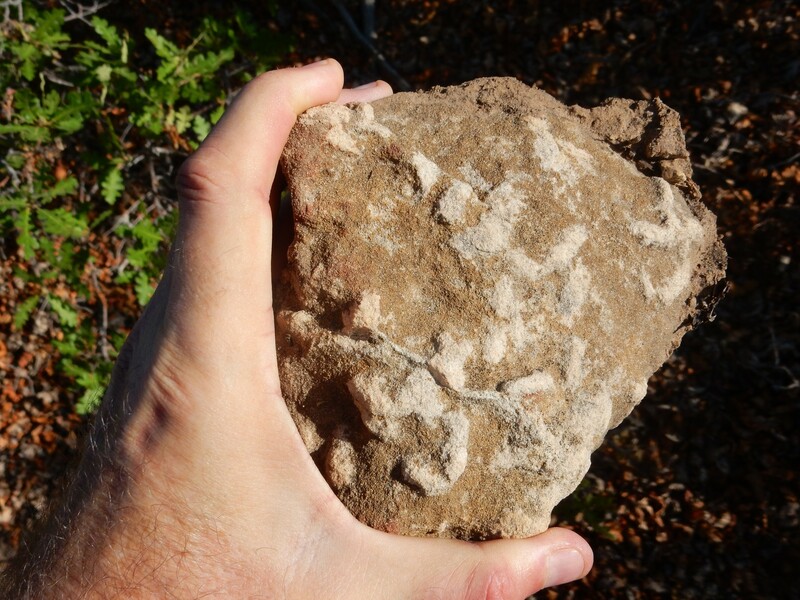 The gray is mudstone; the white is freshwater limestone reputedly containing bird tracks. I do not know this at the time and do not search for them. 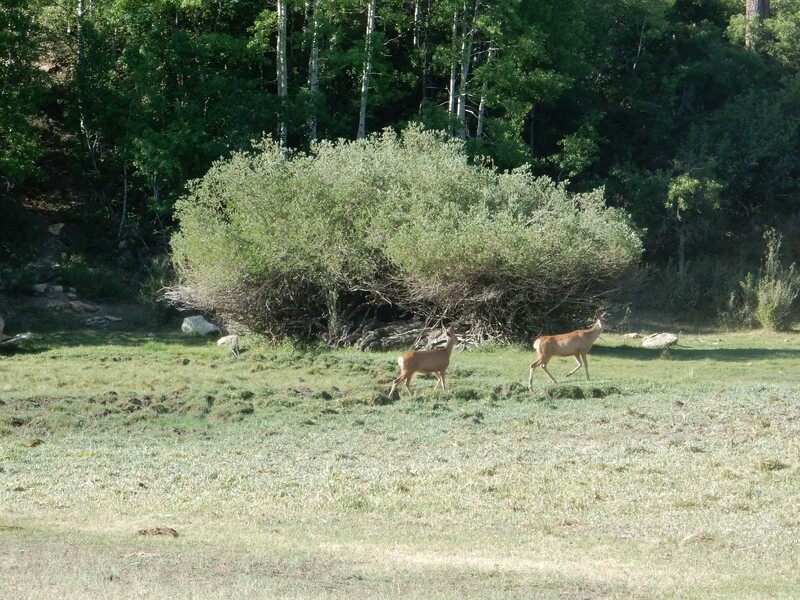 Also, there are two dead deer here; for some time, so I have to stay upwind. This is not actually a formation. 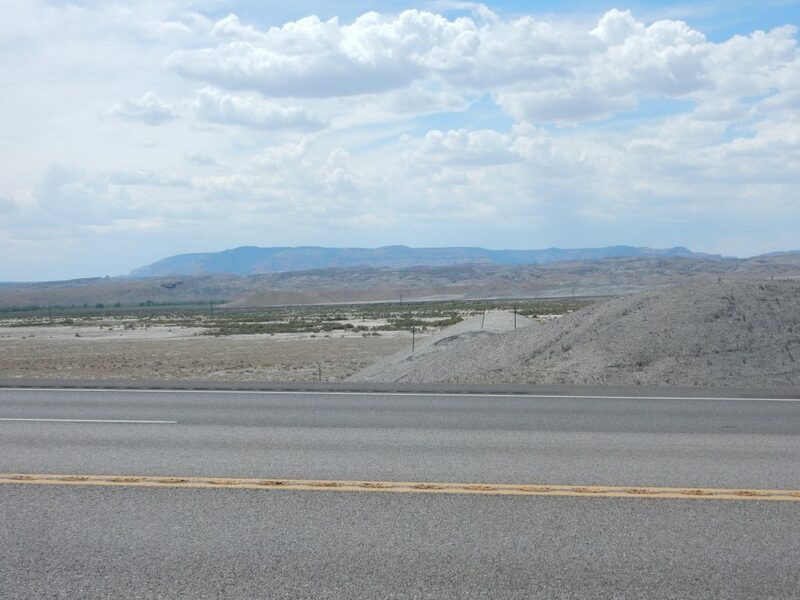 Or you could describe it as Anthropocene conglomerate of the Utah Highway Department Formation. 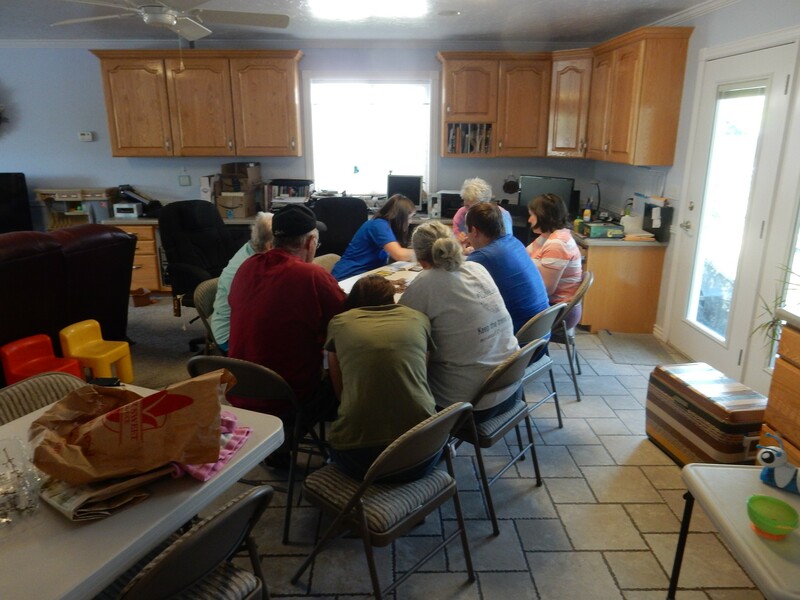 I arrive in Provo at my sister’s house to find the gang huddled over the latest board game. Something about a spooky mansion infested with zombies. I used to enjoy wargames, but I’m not much on other board games, dislike most card games even more, and this involves both. I busy myself settling in, wait until the game is over, then have an absolutely delightful conversation with Lori, Mom, and their various offspring and spouses over dinner. I had my cell phone plugged into the car charger all day, but to none effect. I’ve brought the wall adapter; it, too, fails to start the phone charging. Robert offers to let me use his big charger, and the phone finally starts charging. We talk, and he explains that cell phones will tend to wear themselves out trying to find a cell tower when there’s none around. Well, I was in some of the most middle of nowhere places left in the lower 48 yesterday; that could explain the rapid discharge. I resolve that I will leave the phone off when I’m in a back of the woods area the rest of my trip.